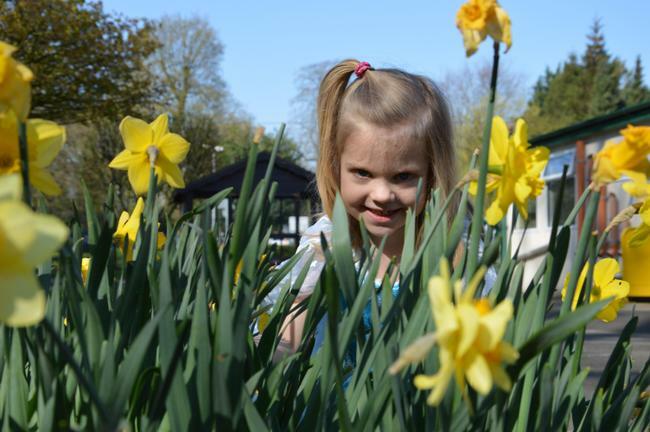 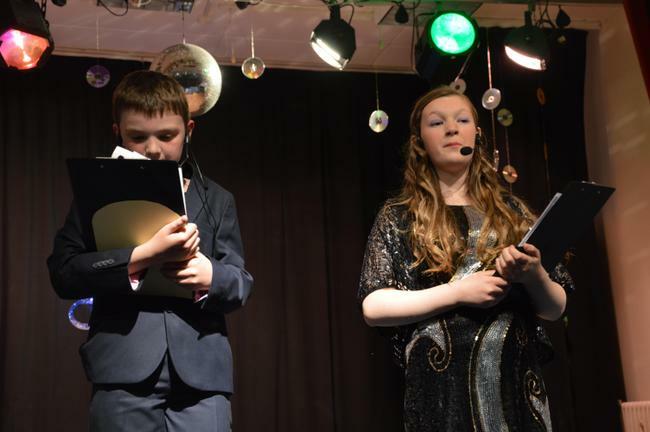 on the evenings of 20th and 21st May 2015. 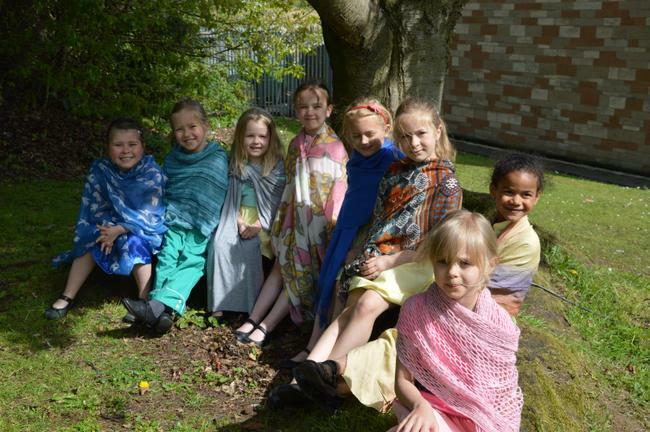 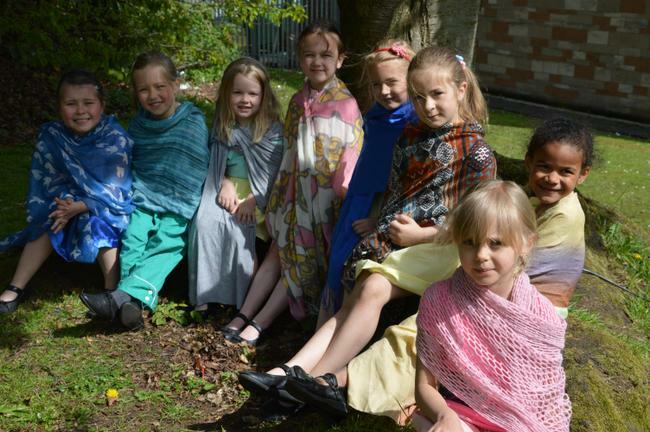 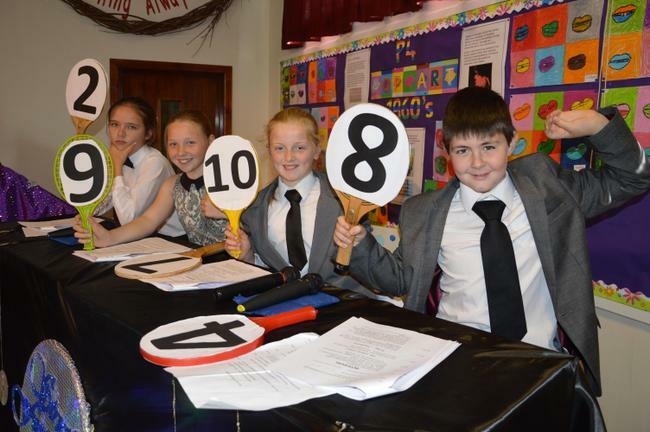 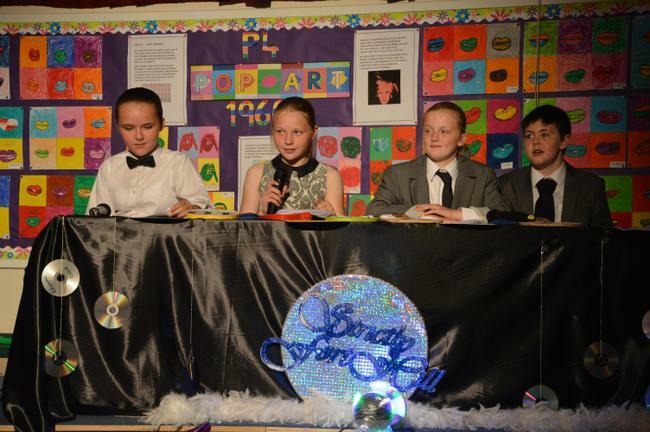 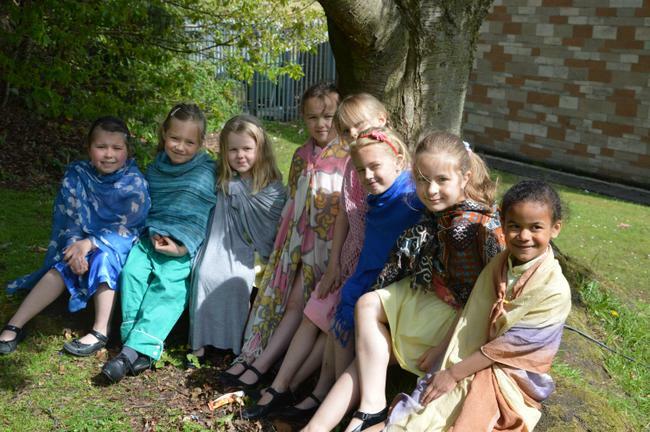 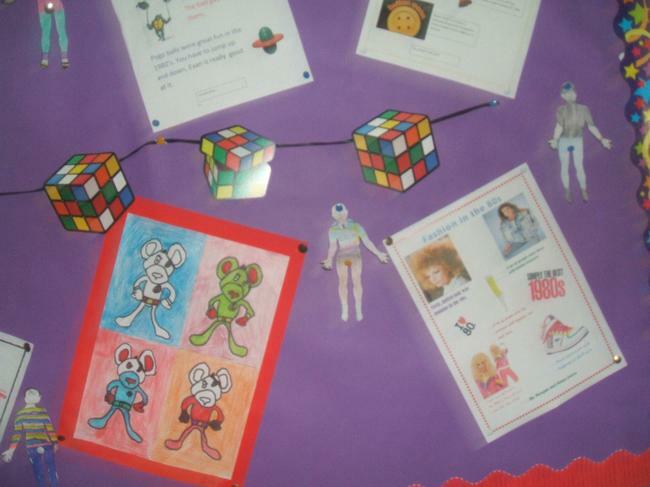 The P3-P7 children had been learning about the last five decades. 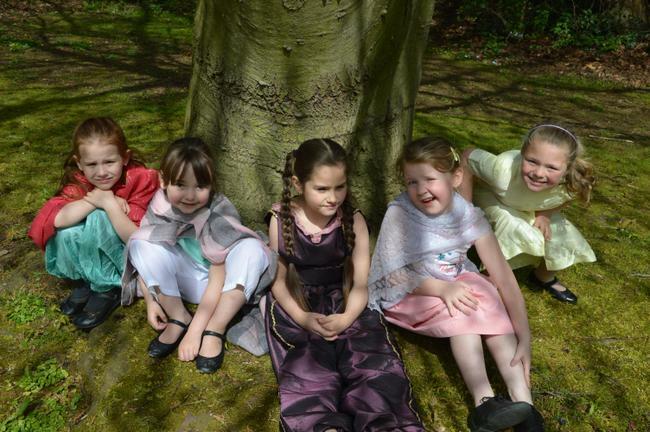 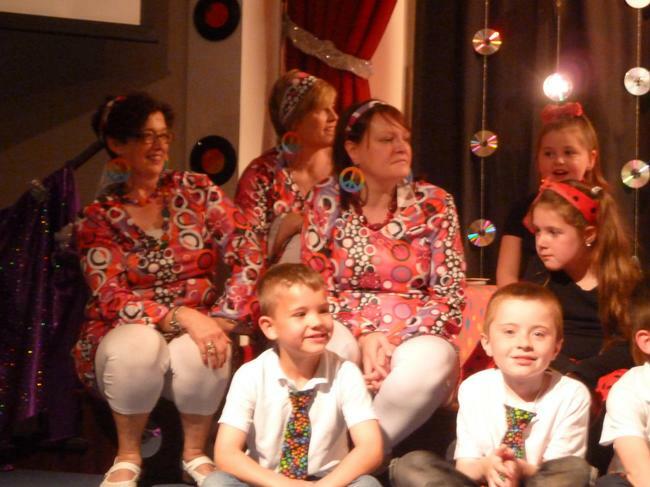 P4 the swinging 60's, P7 the 70's, P5 the 80's, P6 the 90's and P3 the naughties! 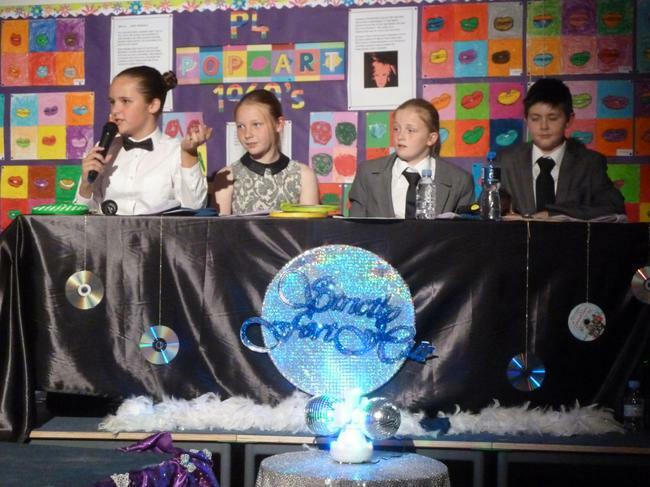 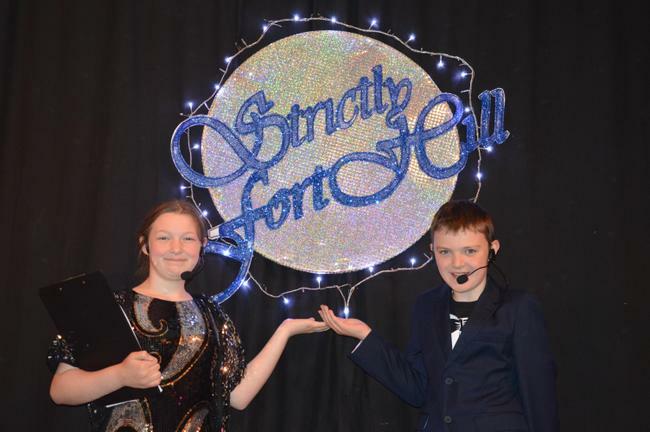 We had our wonderful hosts, Tess Daly and Sir Bruce Forsyth. 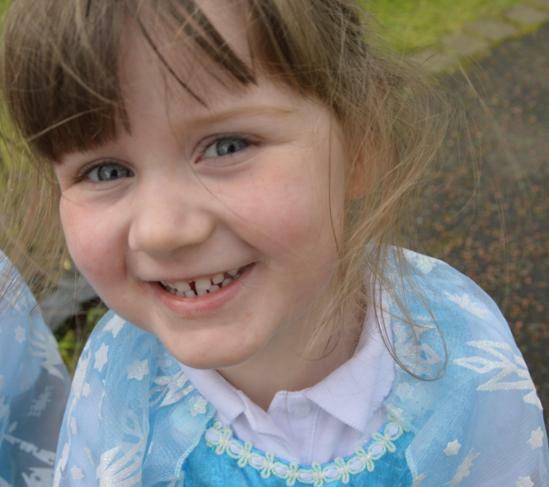 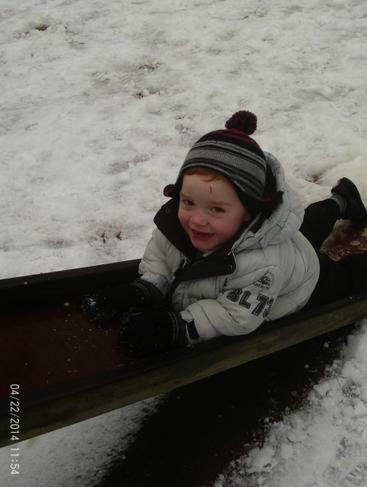 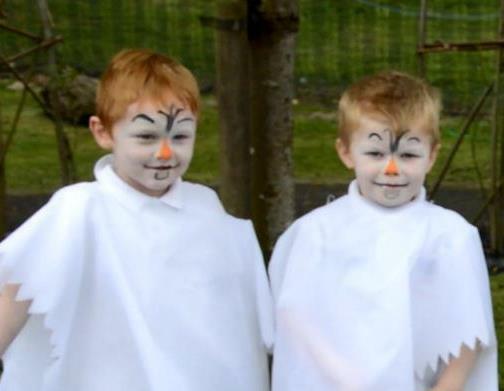 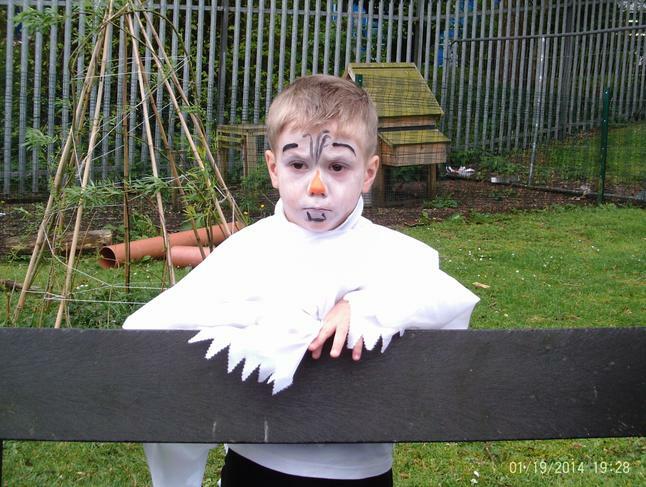 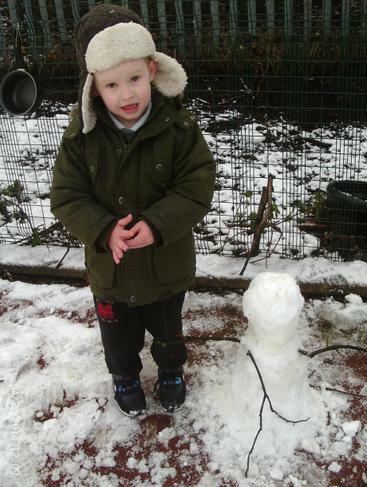 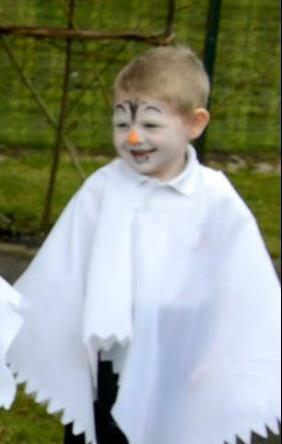 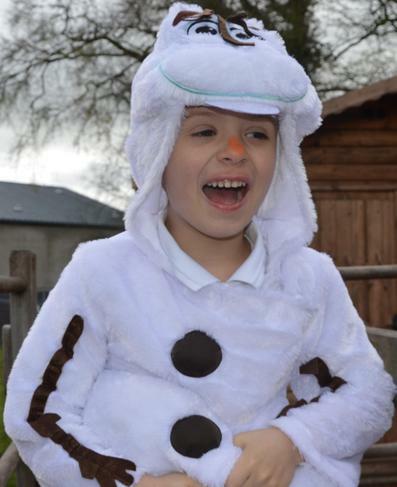 Nursery and Primary 1 sang the song Let It Go! 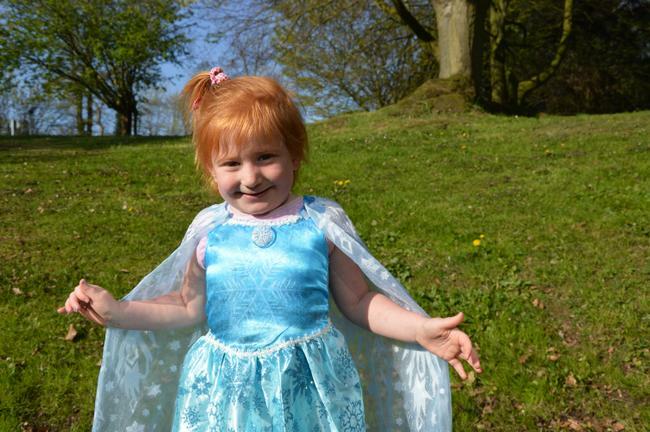 from the popular film Frozen. 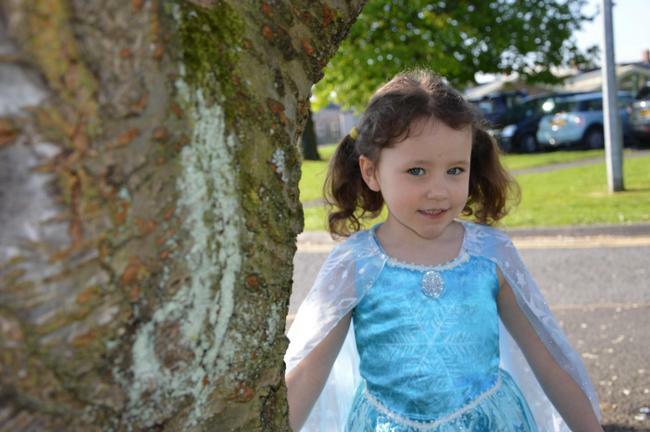 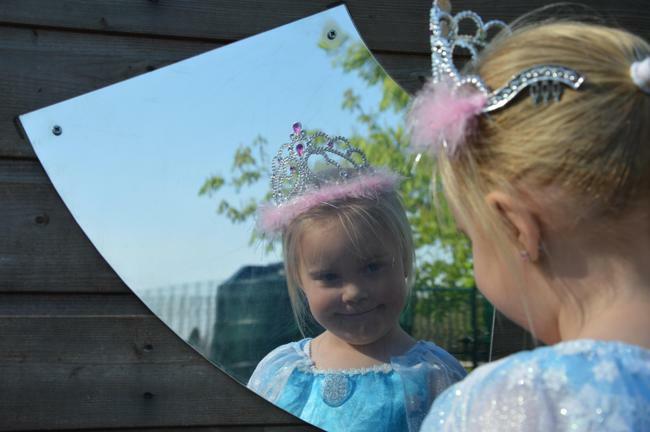 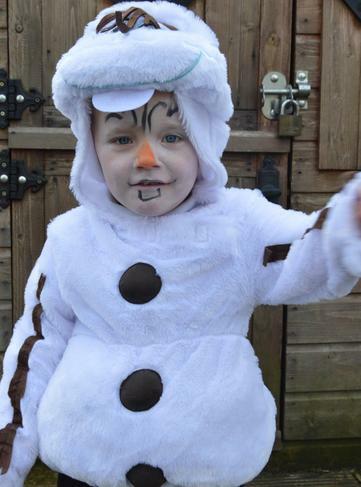 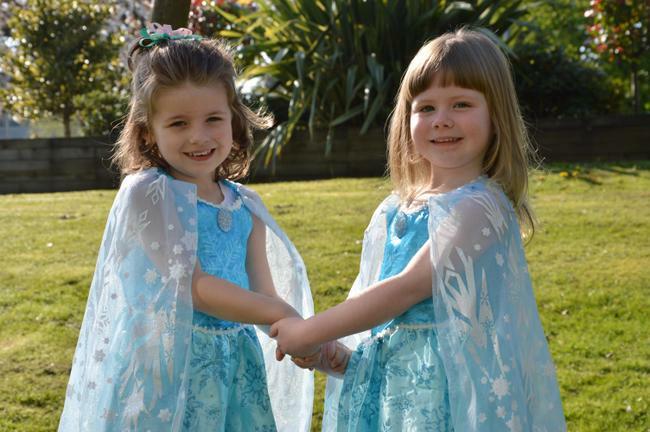 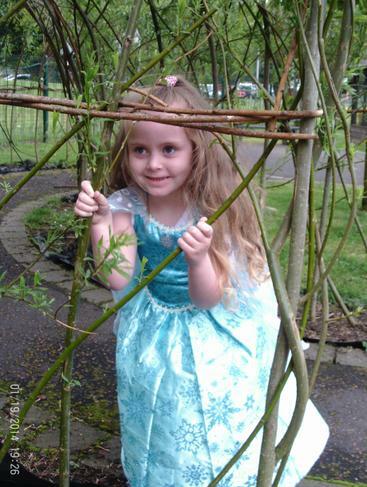 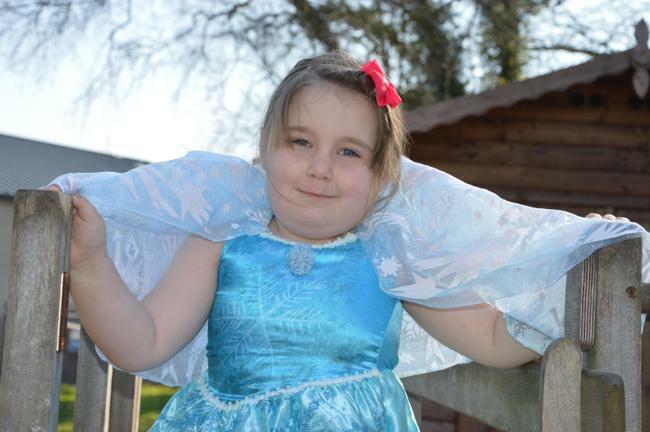 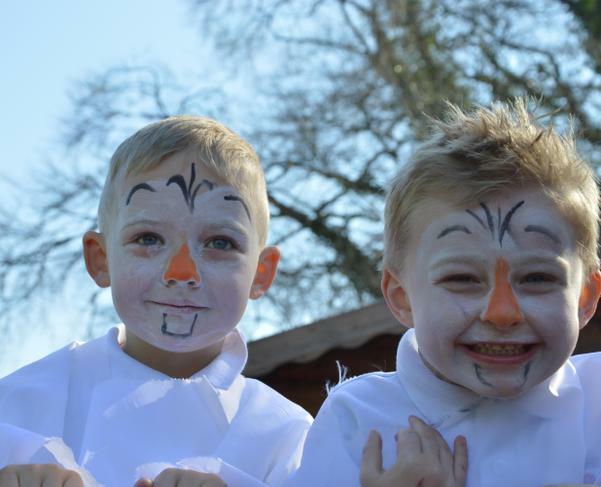 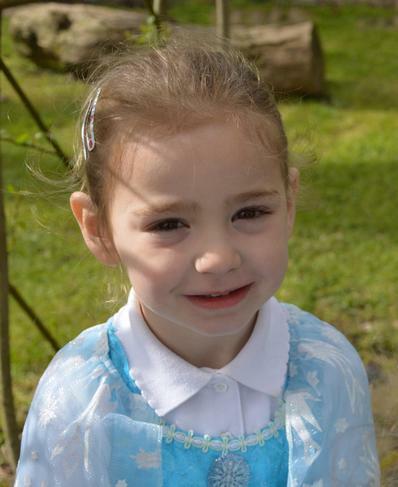 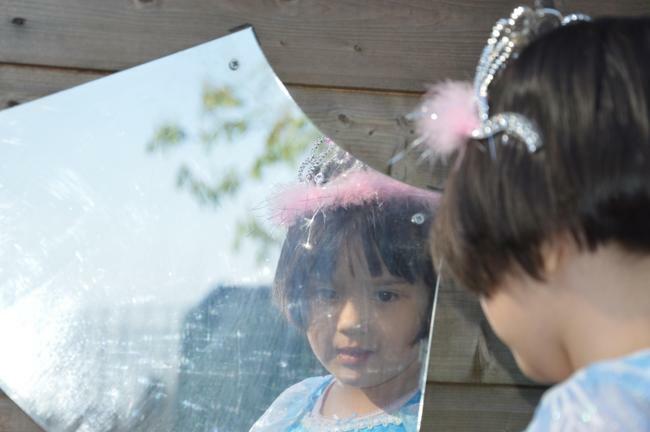 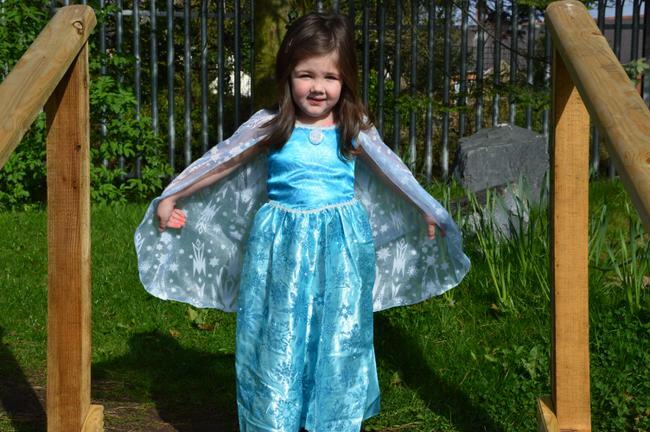 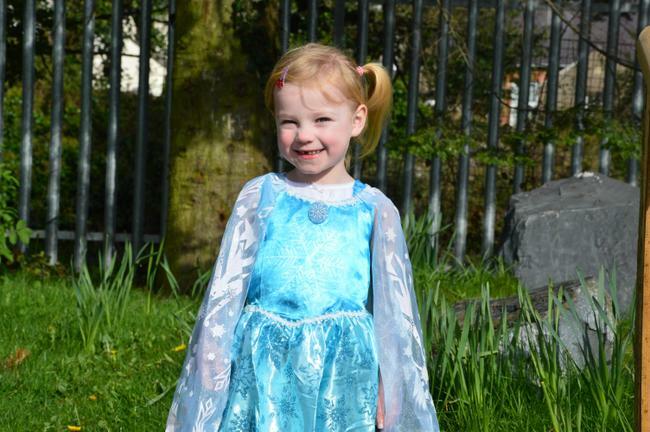 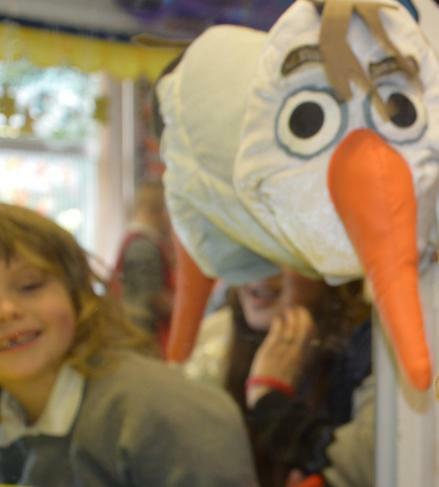 Nursery Pictures of Let It Go! 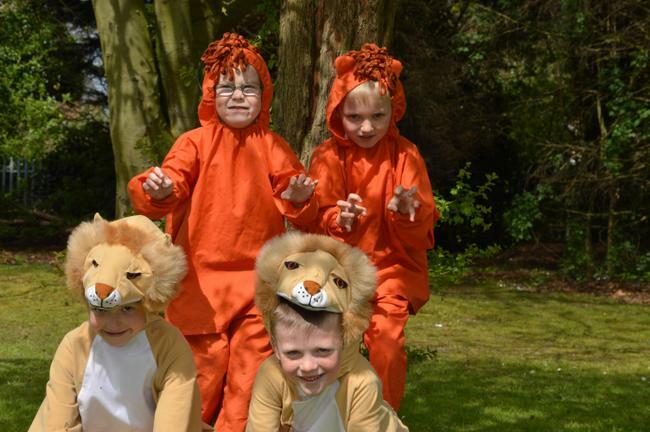 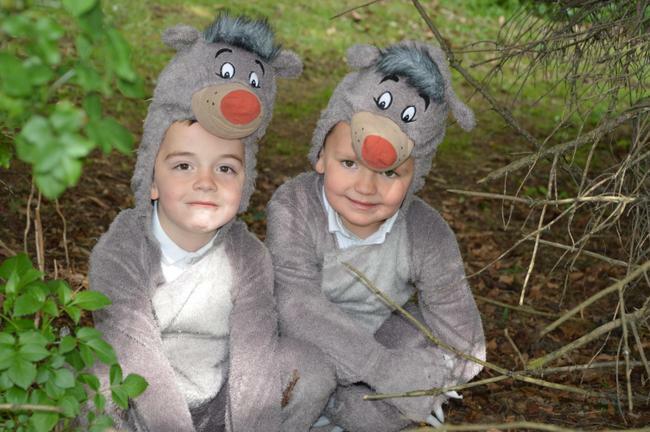 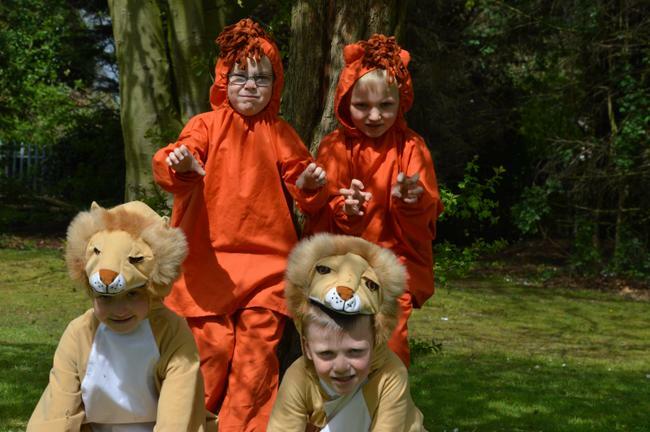 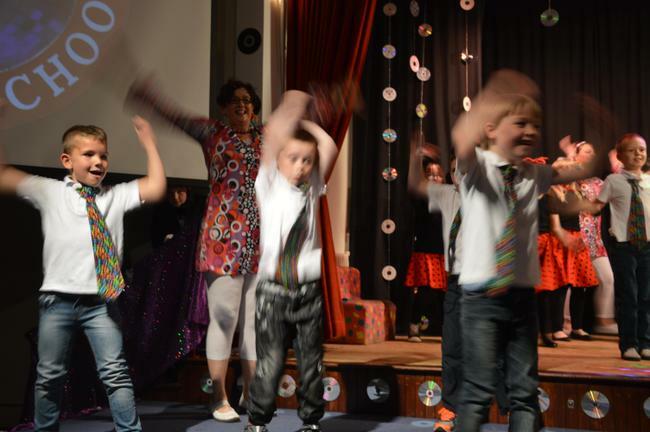 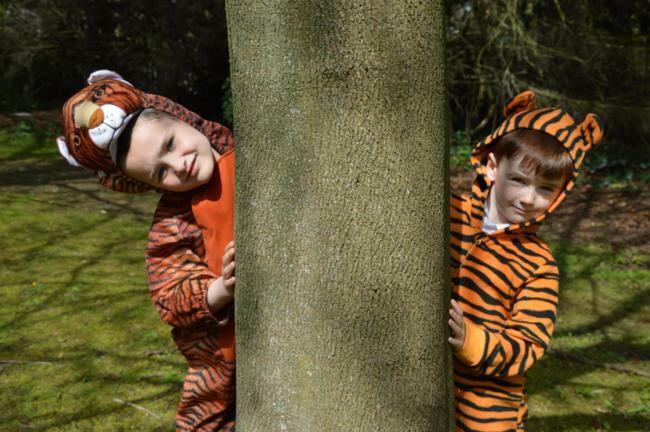 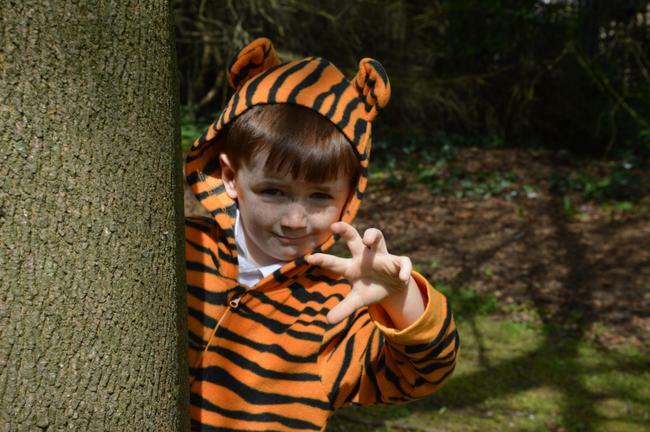 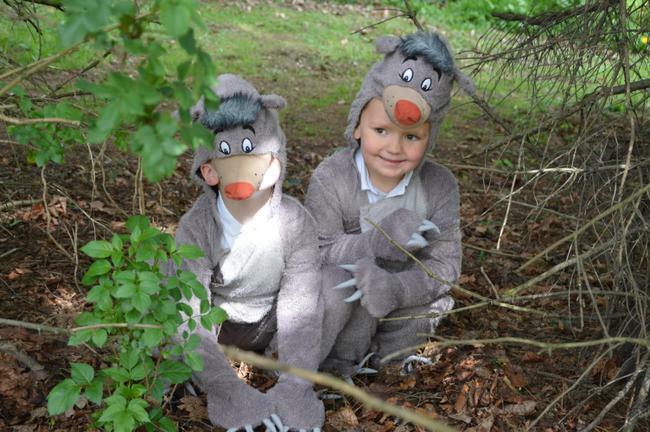 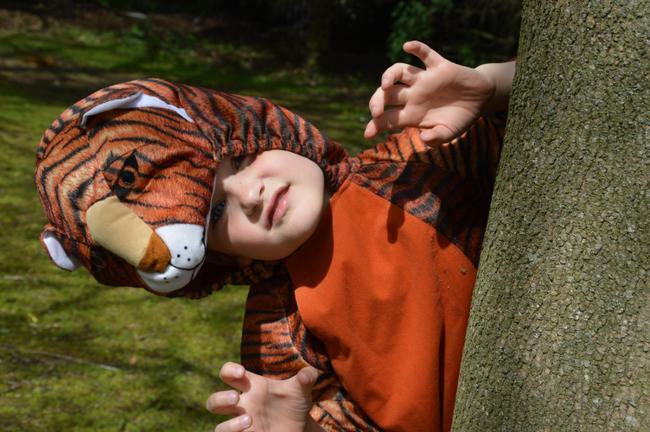 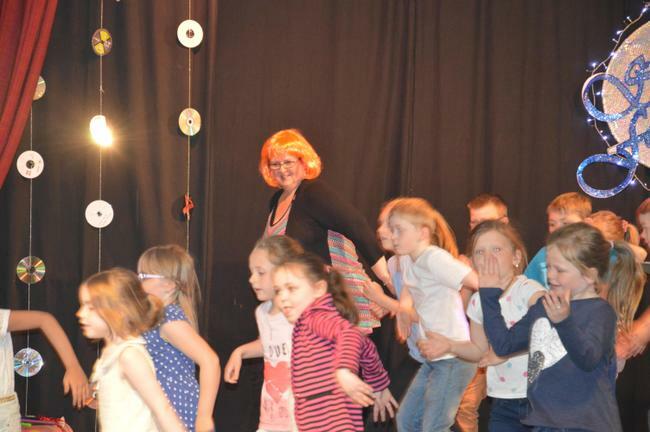 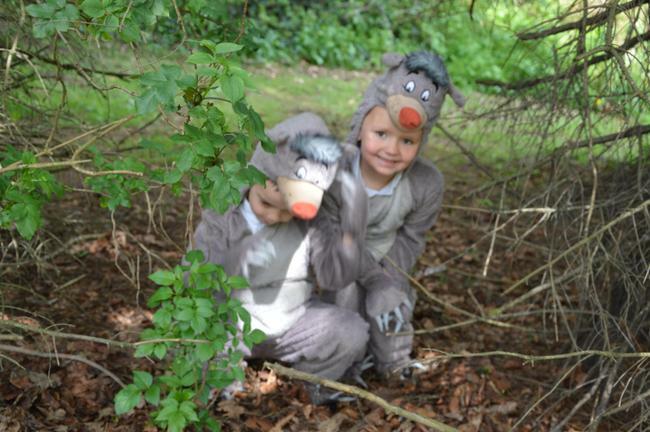 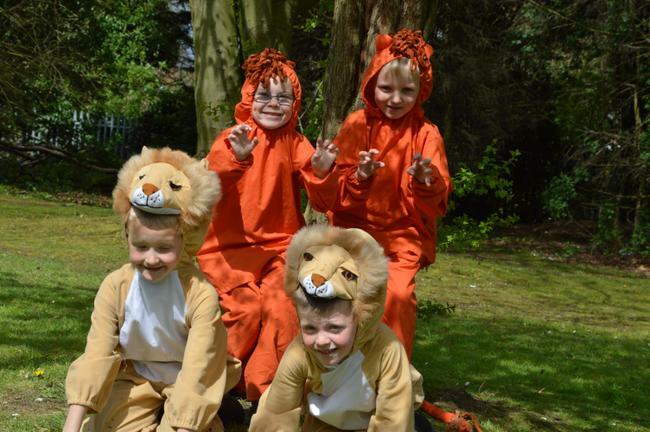 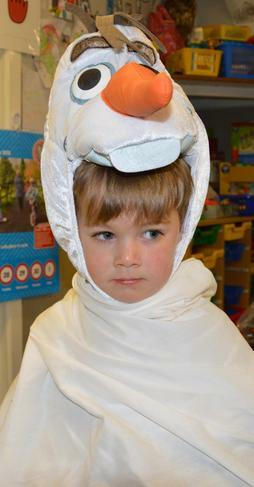 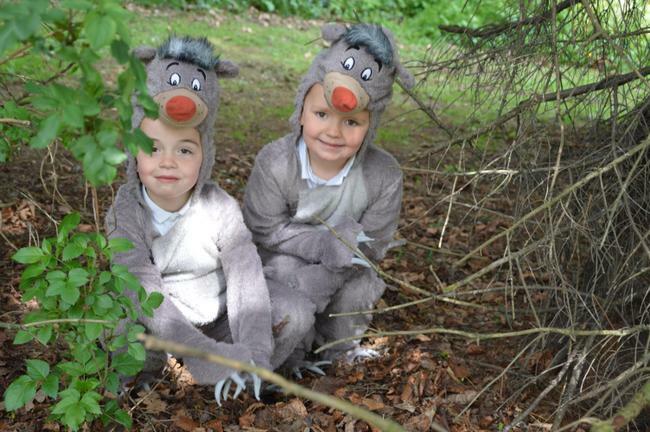 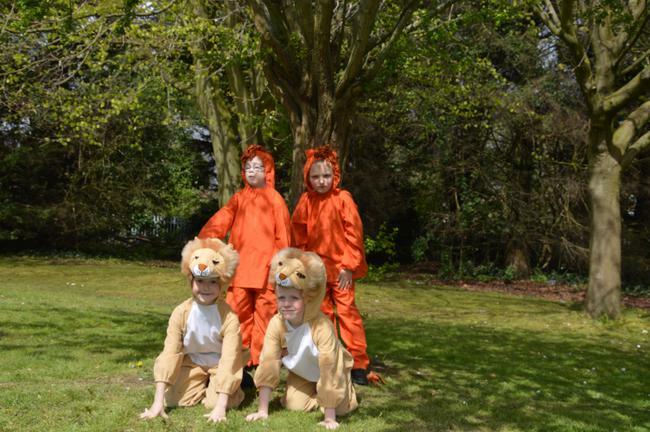 The Primary 2 children watched the original Jungle Book movie from 1967 and danced to 'I wanna be like you'. 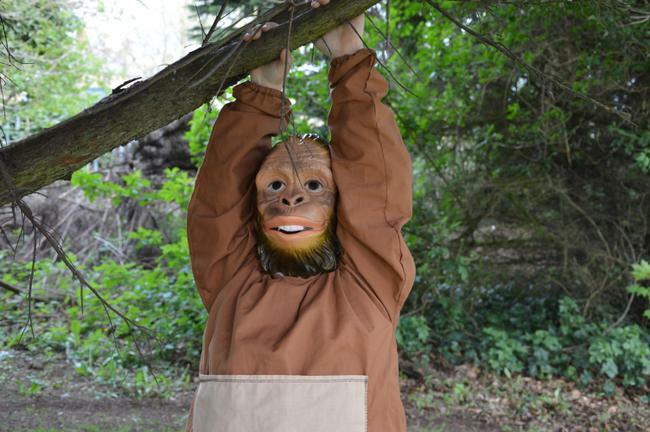 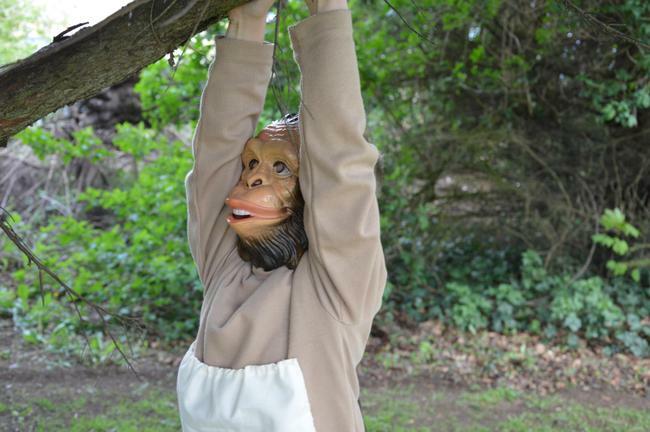 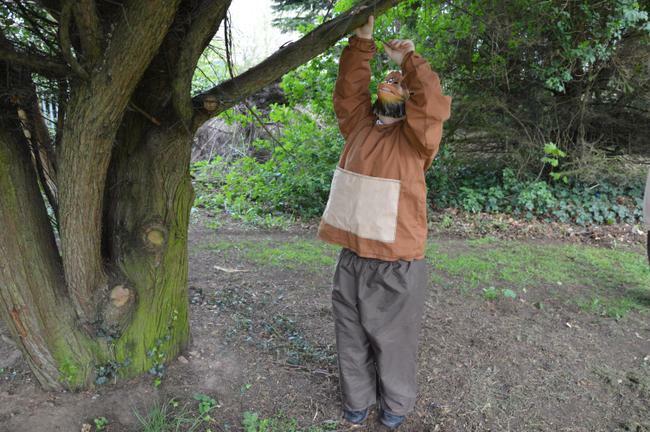 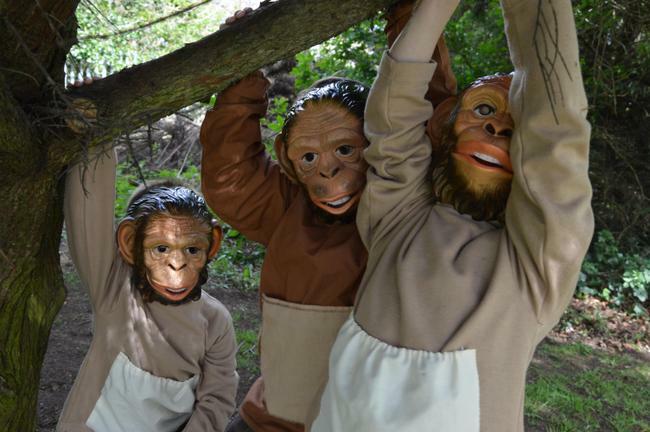 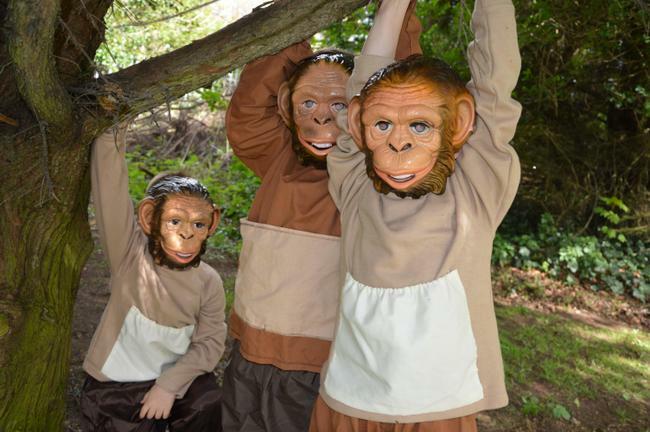 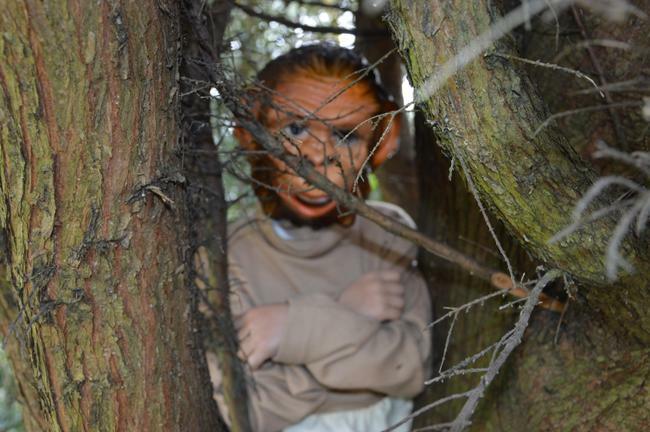 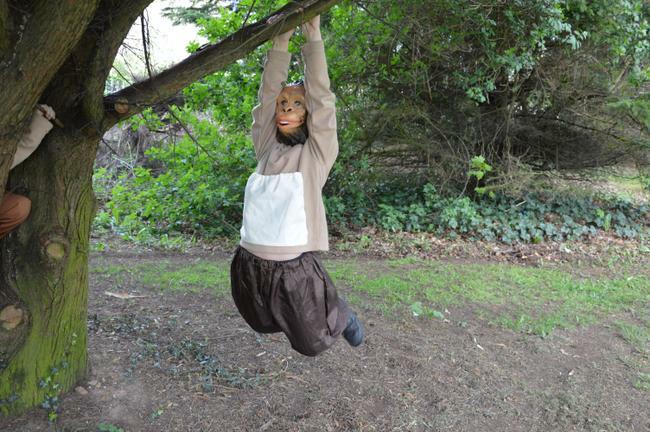 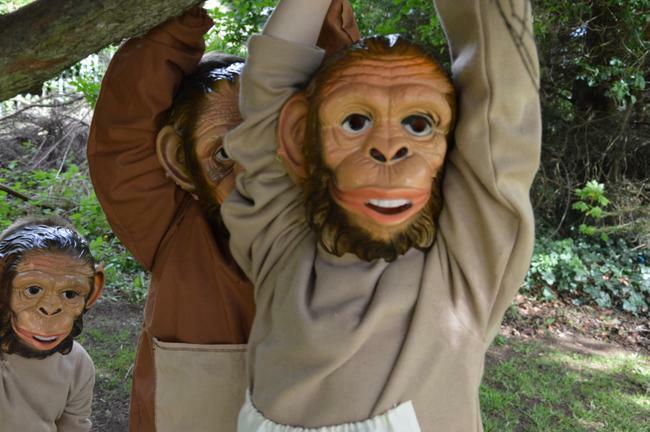 Have a look at some photos of them monkeying around. 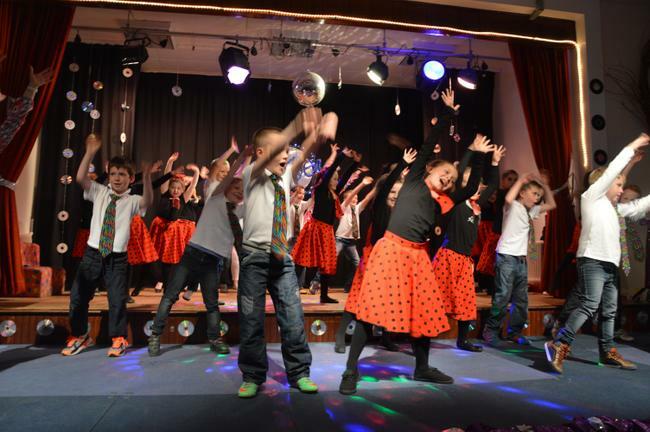 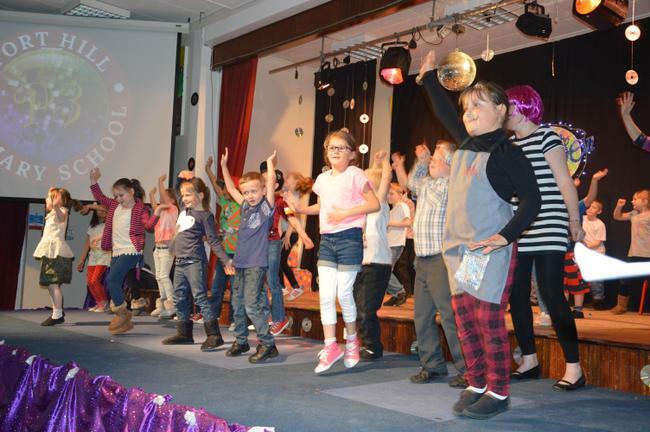 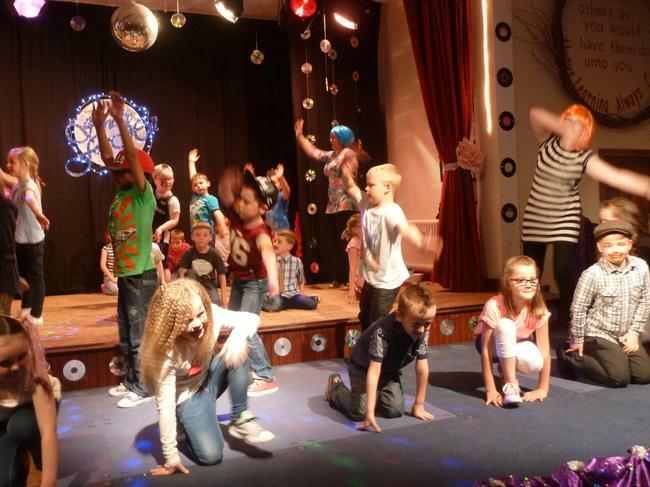 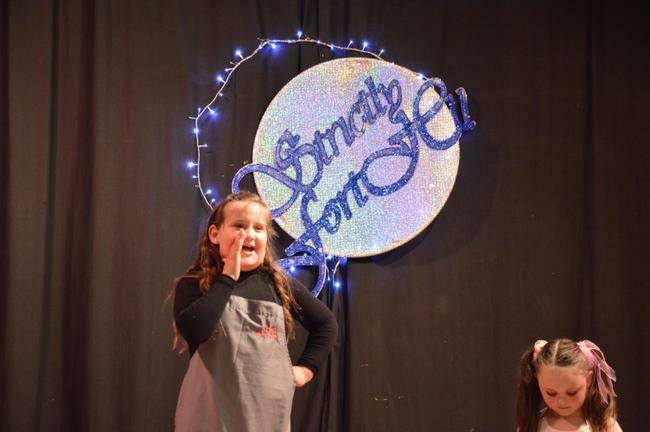 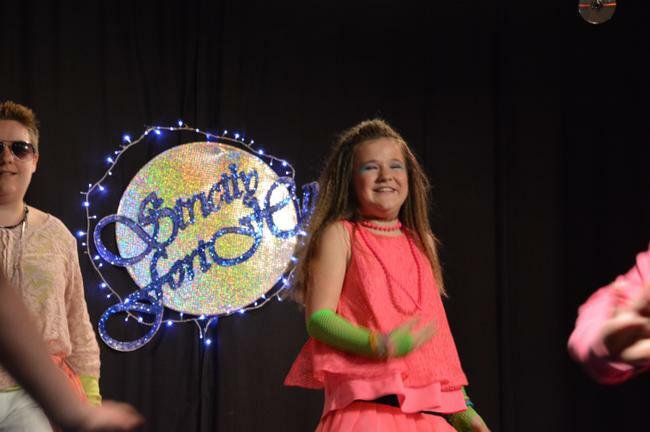 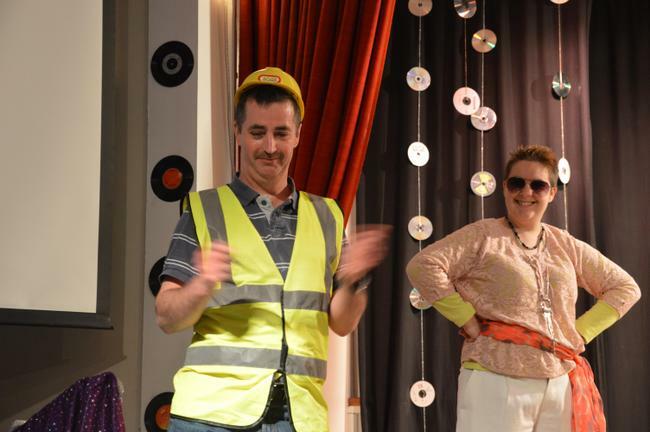 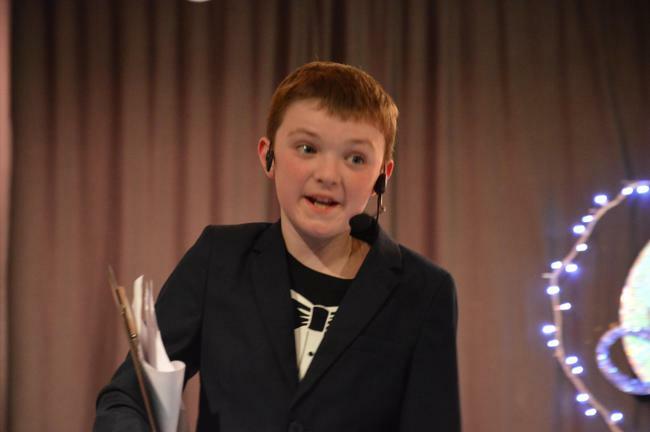 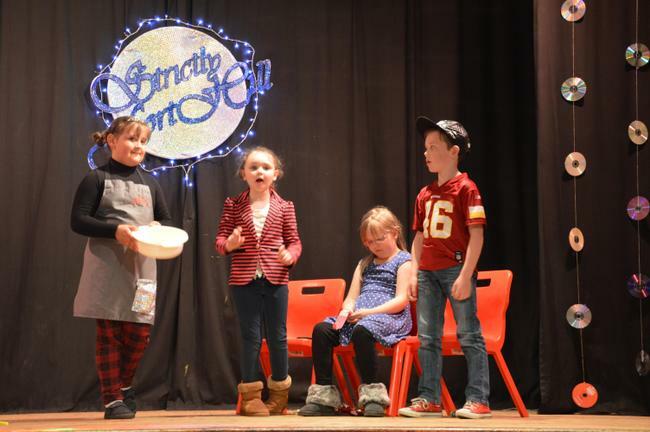 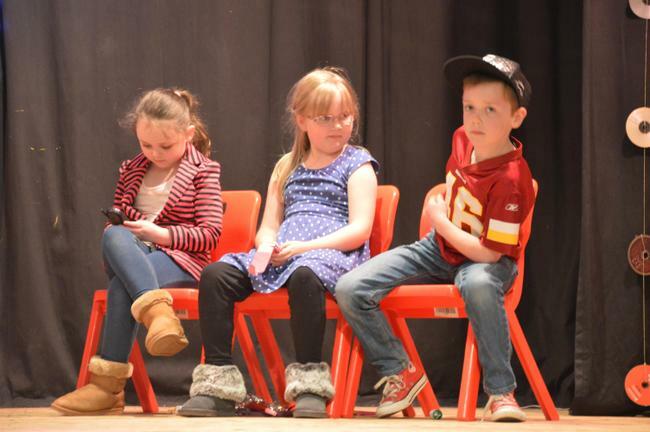 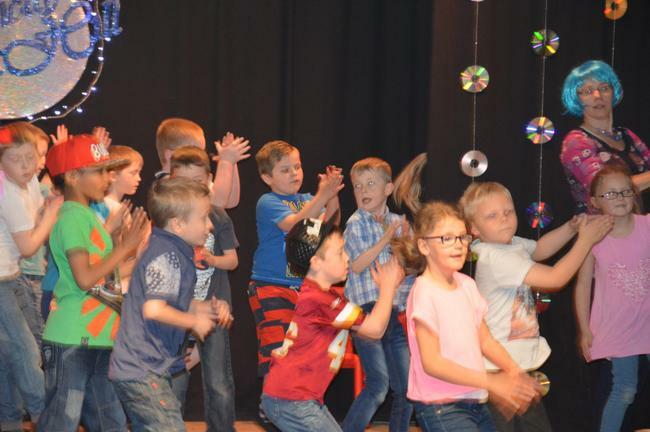 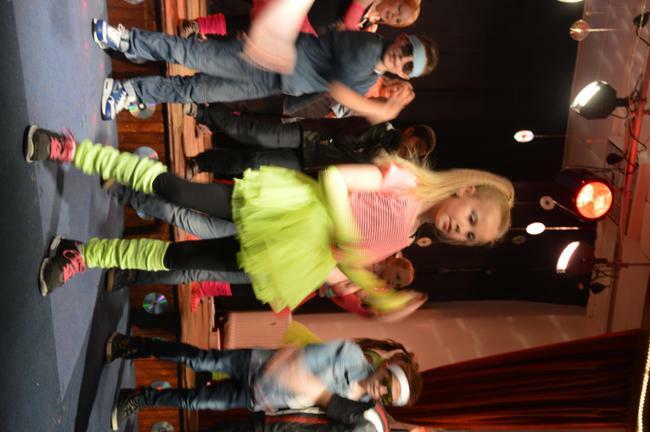 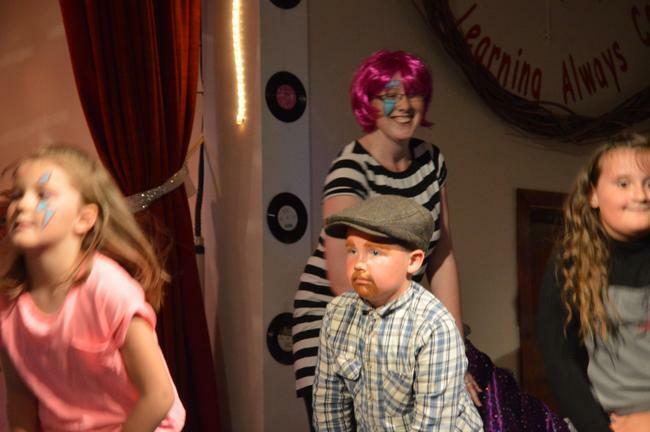 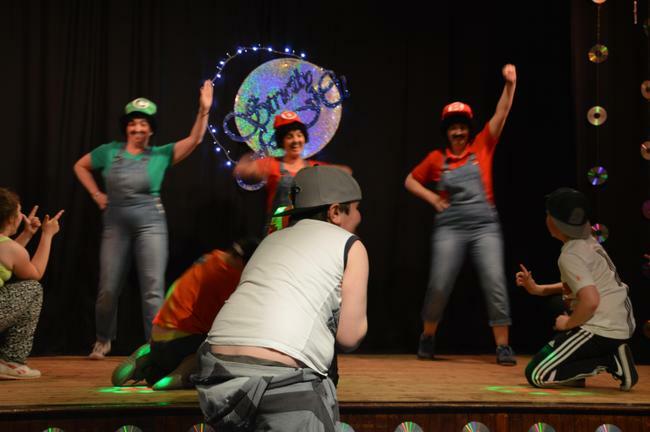 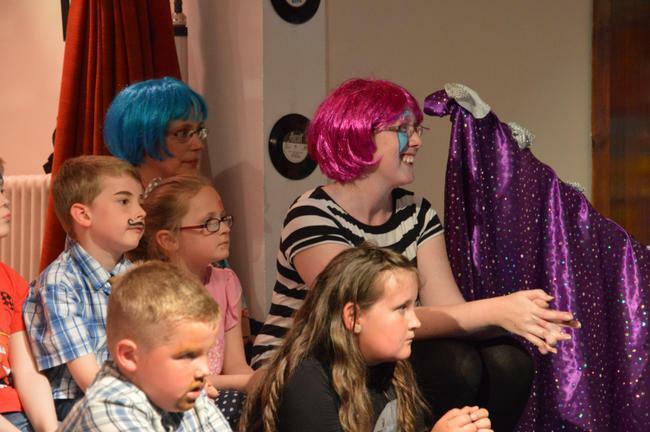 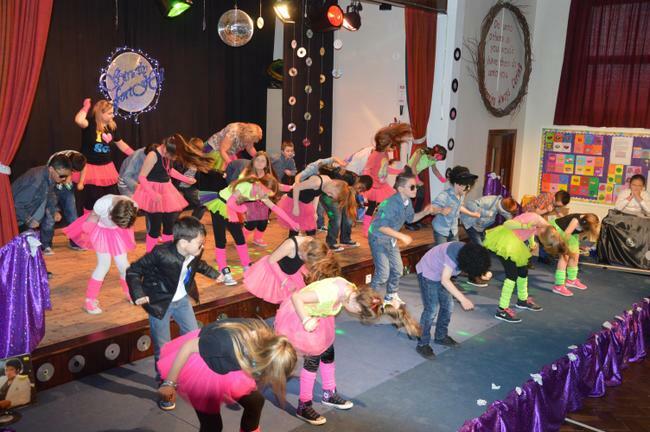 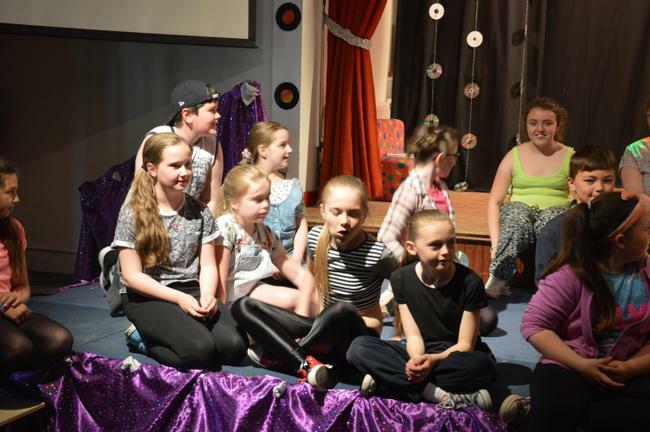 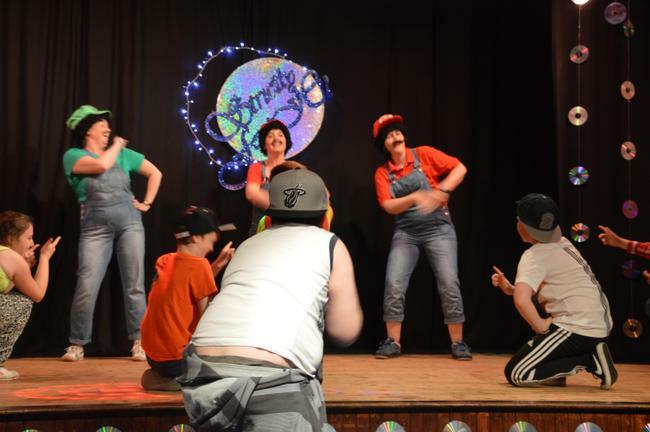 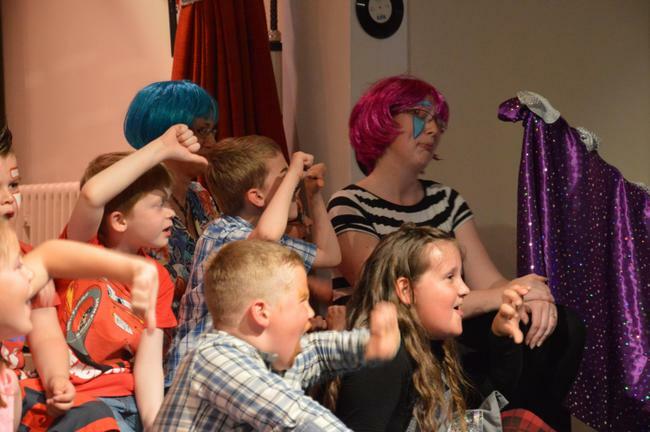 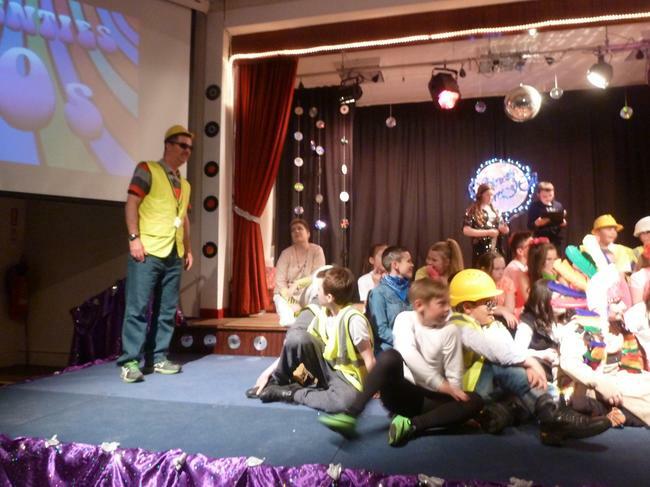 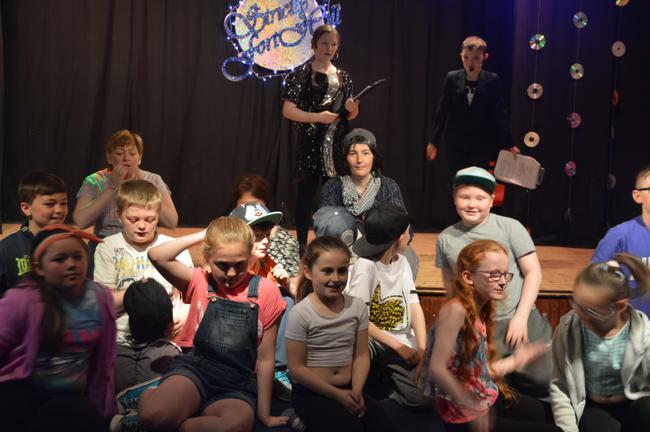 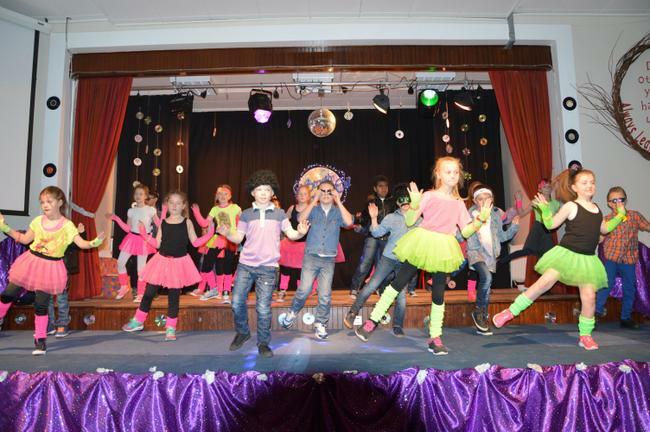 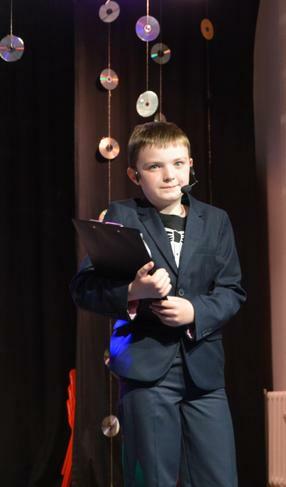 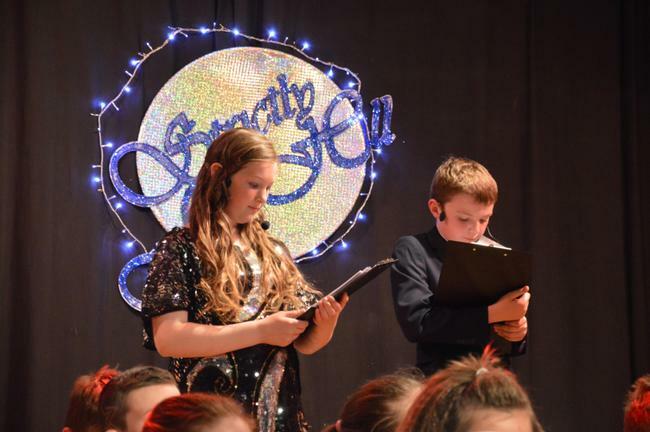 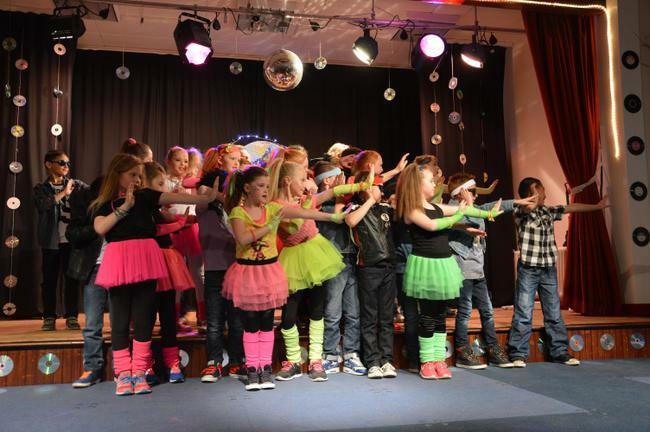 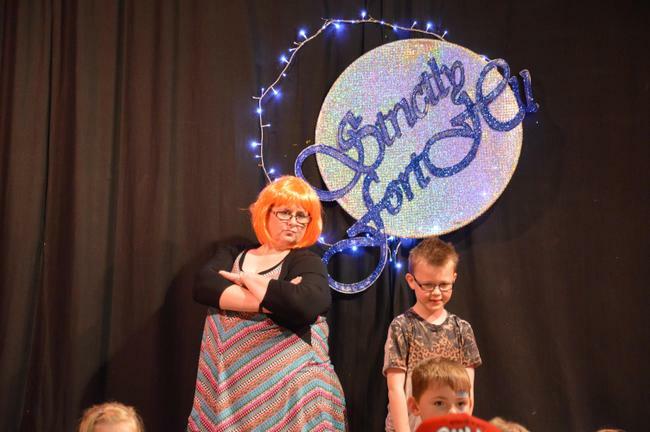 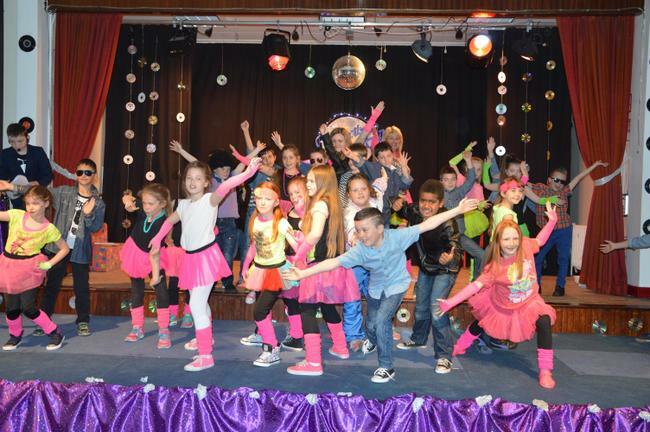 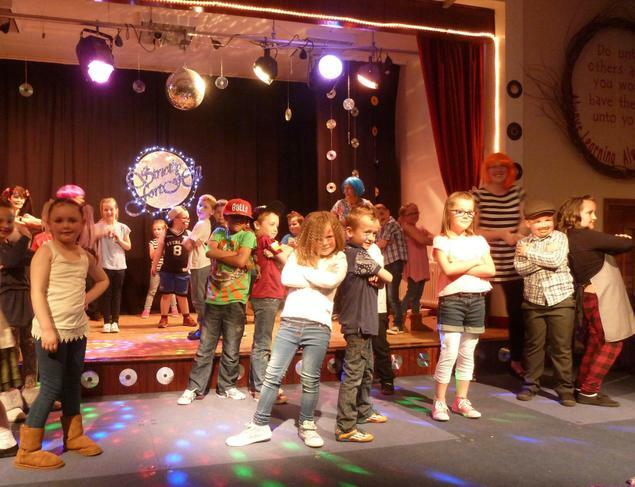 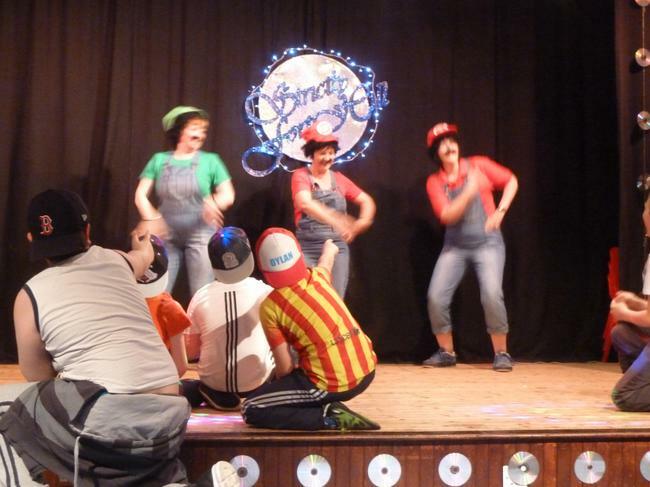 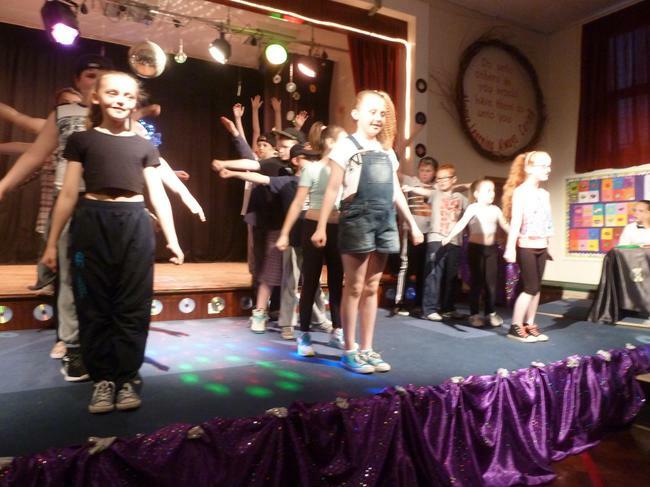 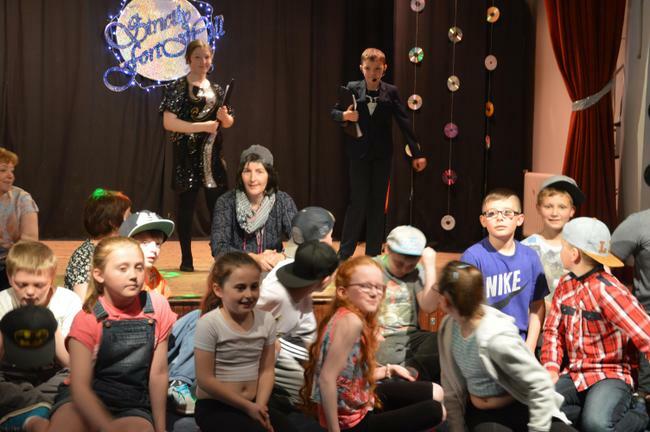 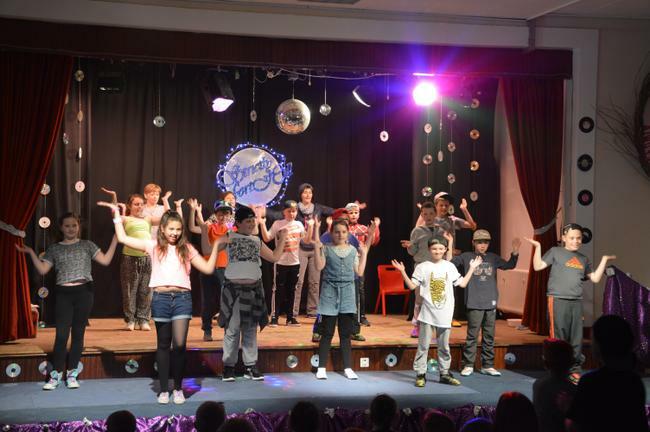 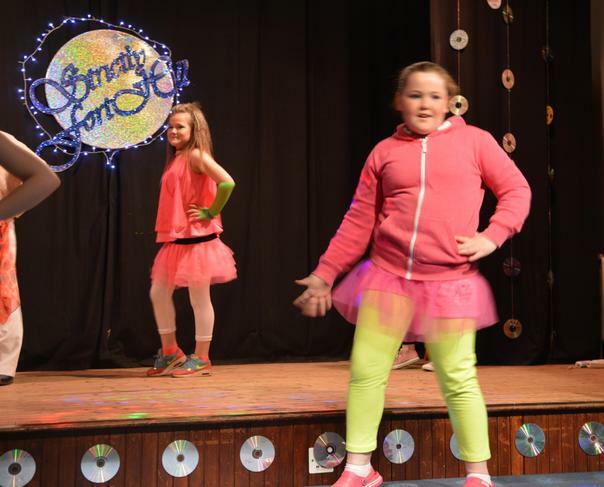 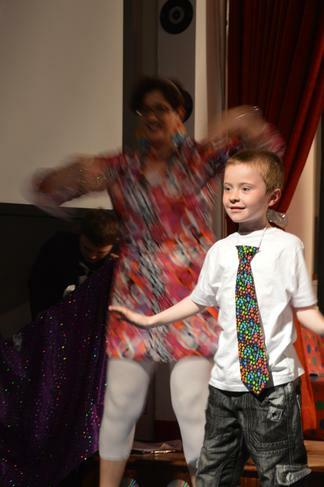 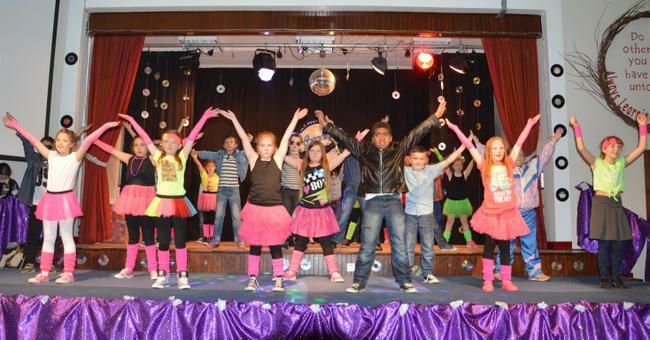 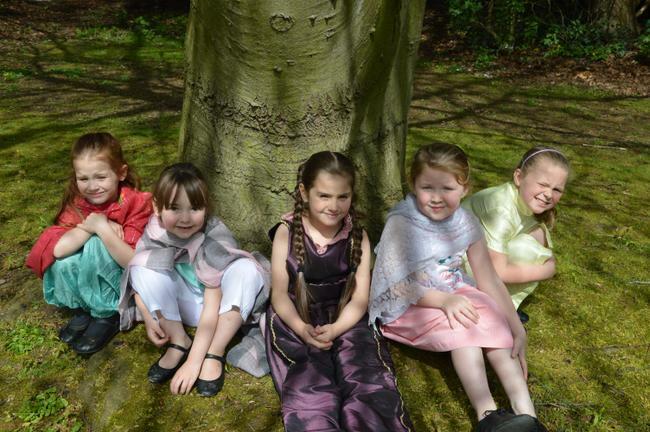 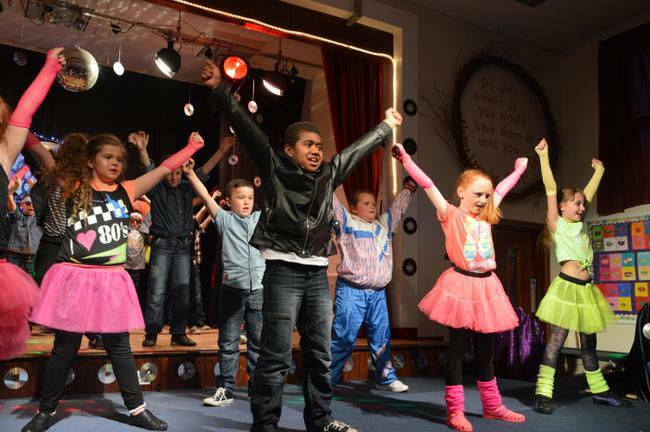 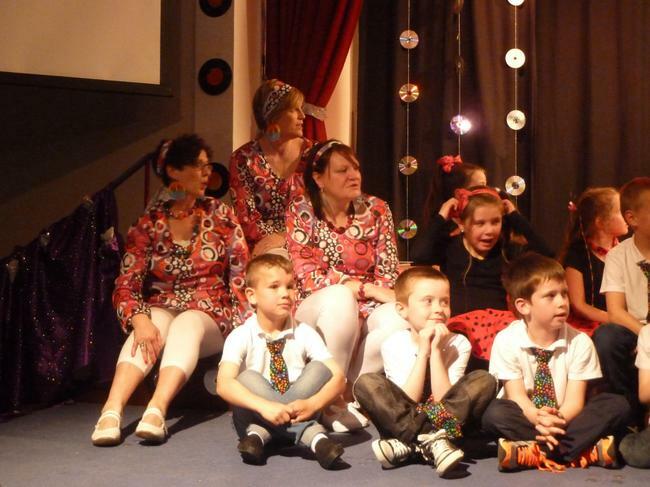 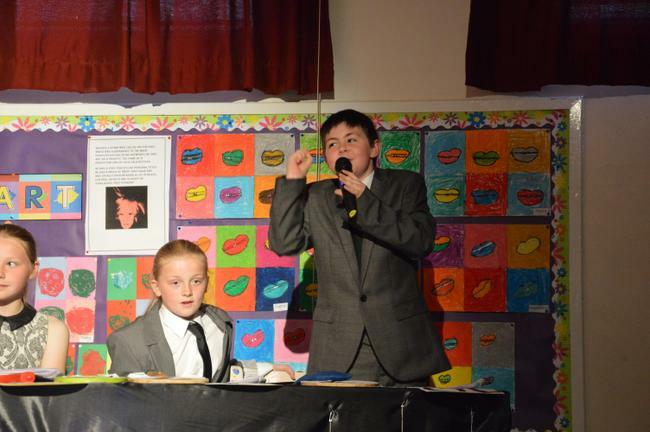 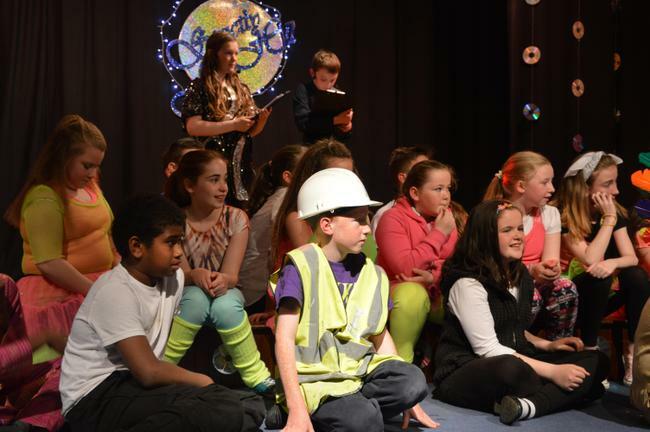 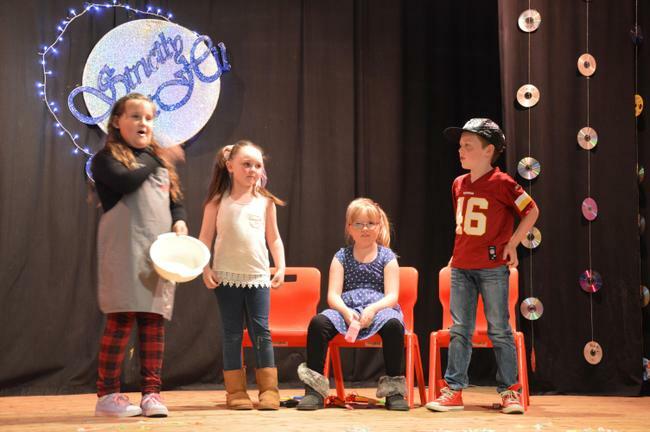 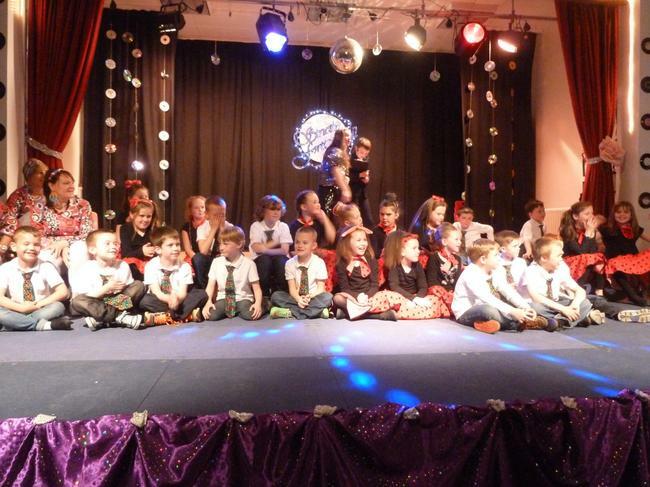 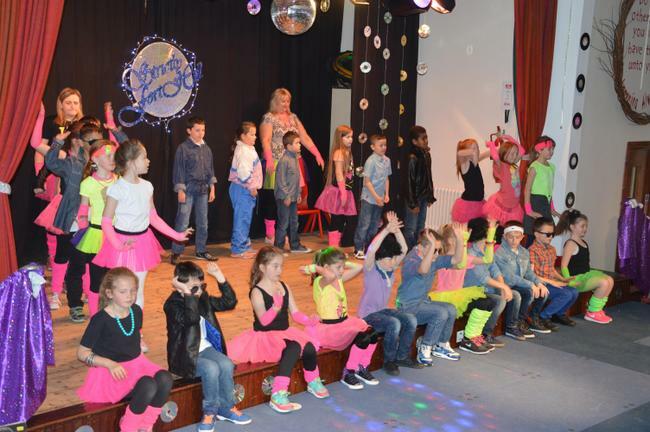 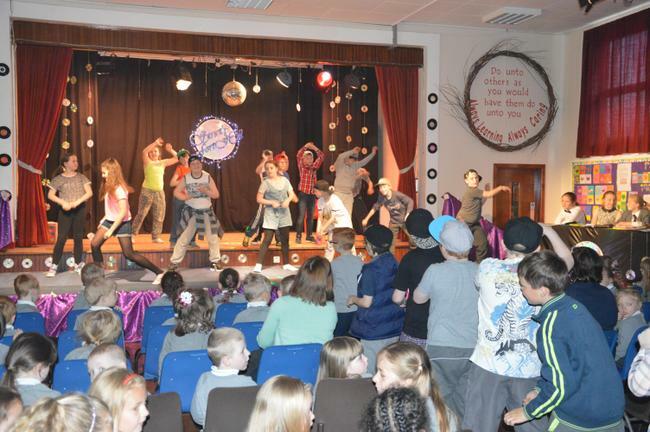 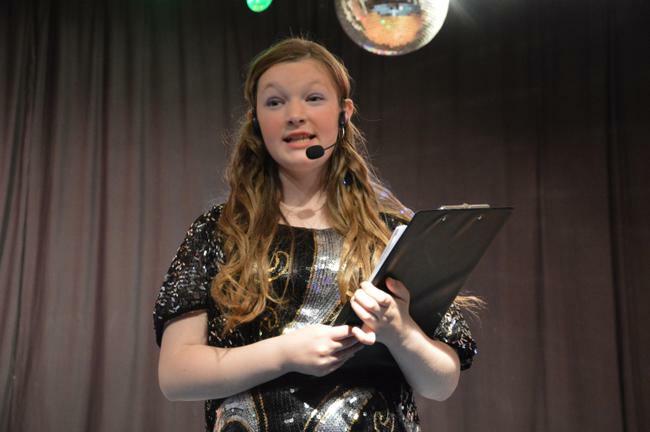 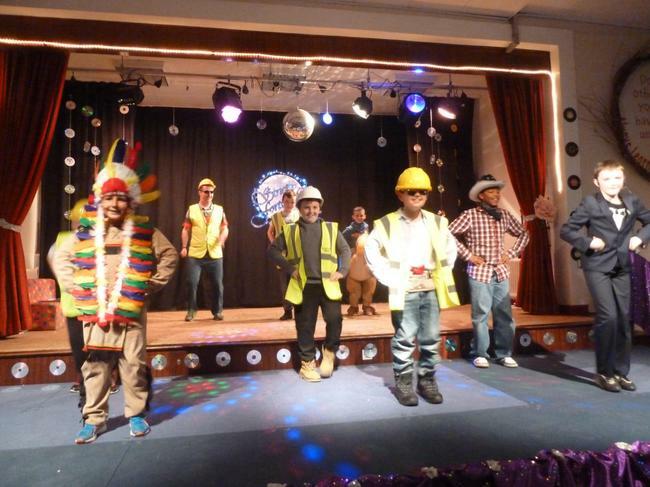 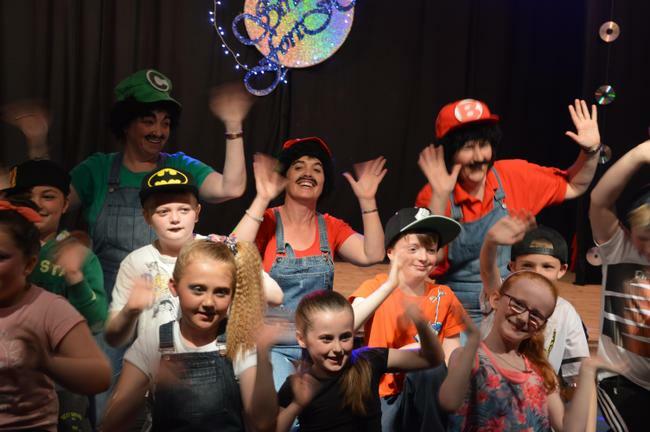 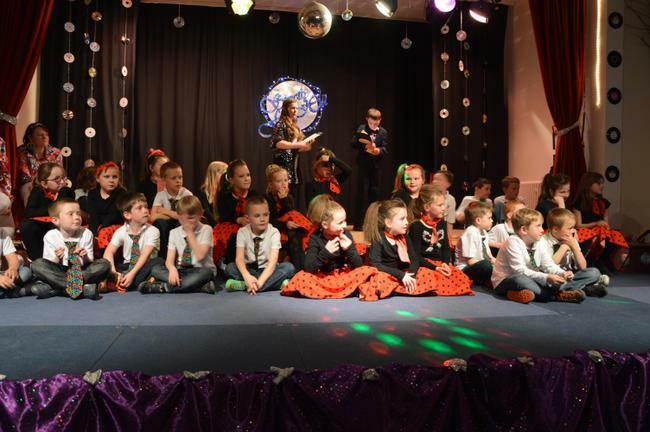 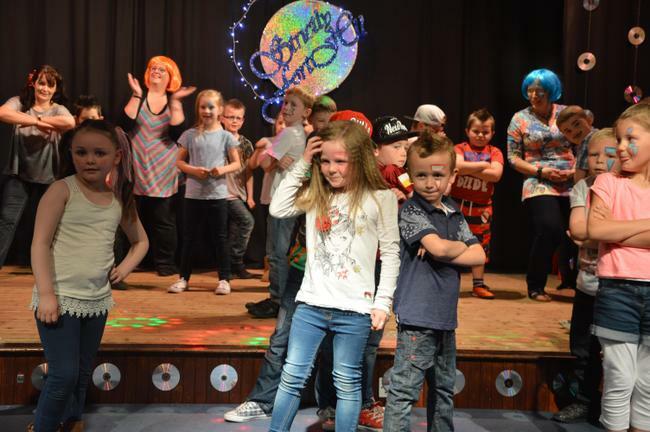 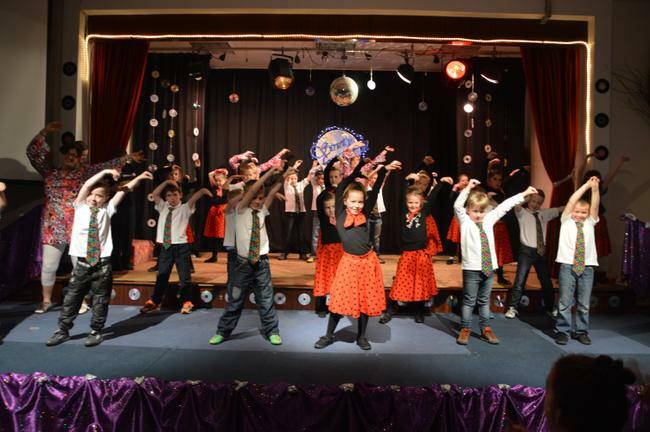 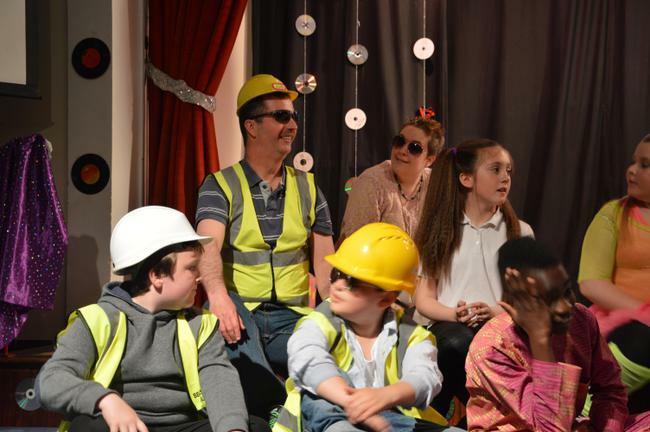 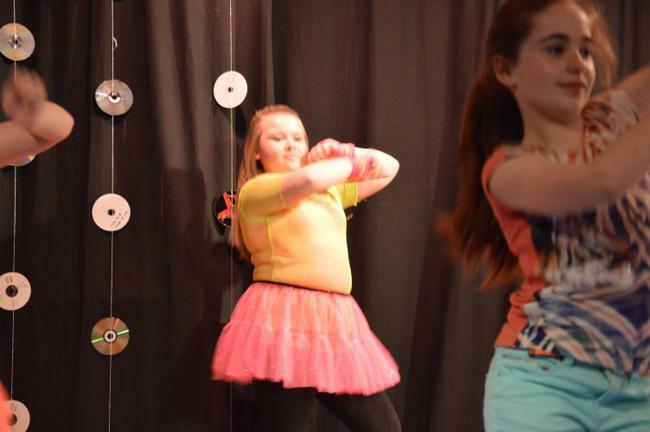 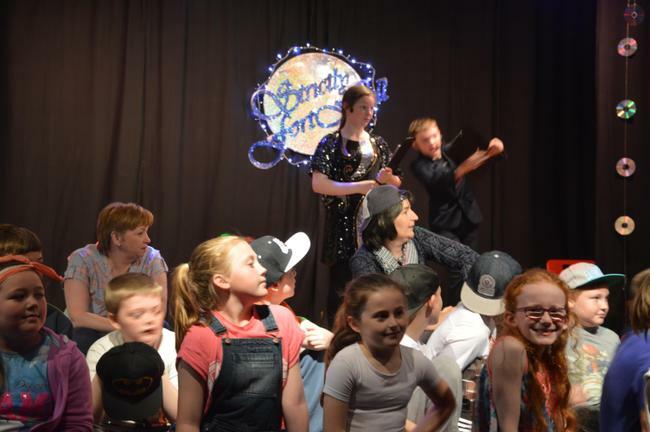 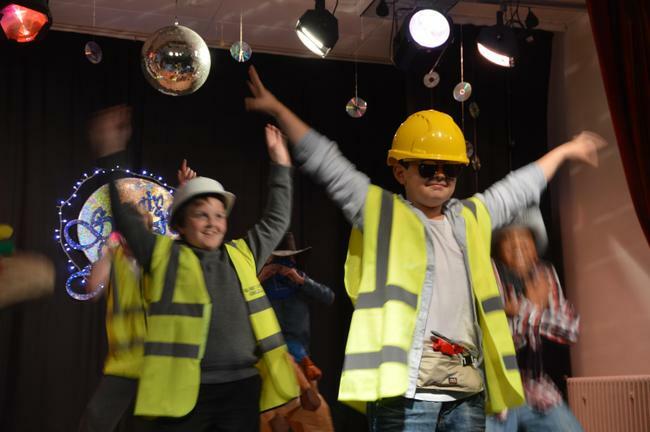 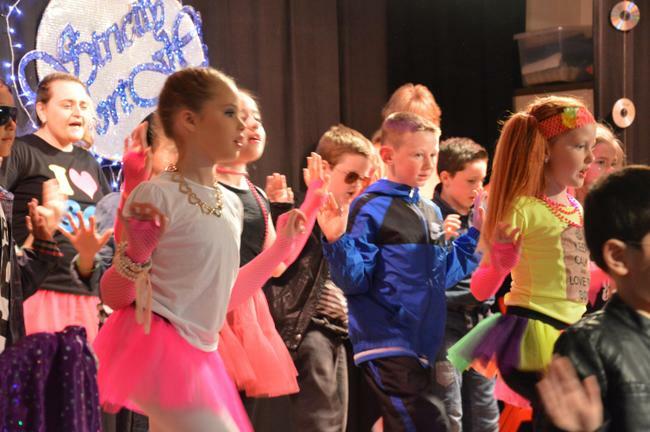 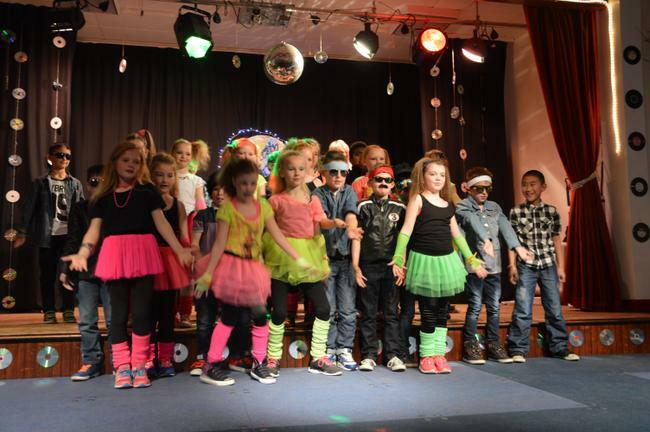 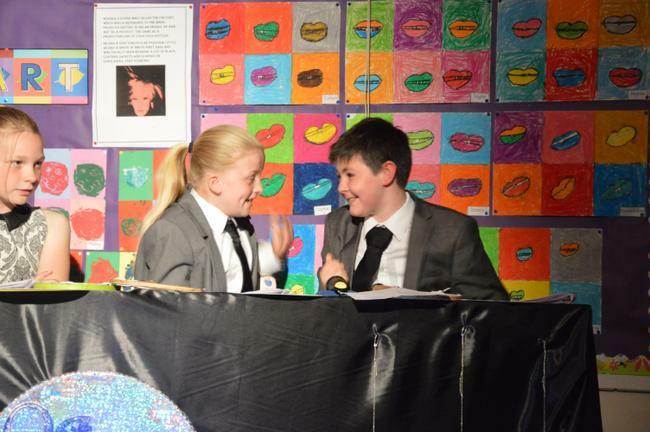 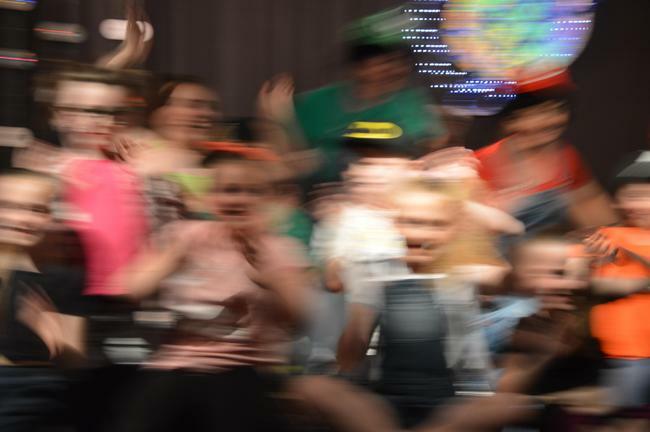 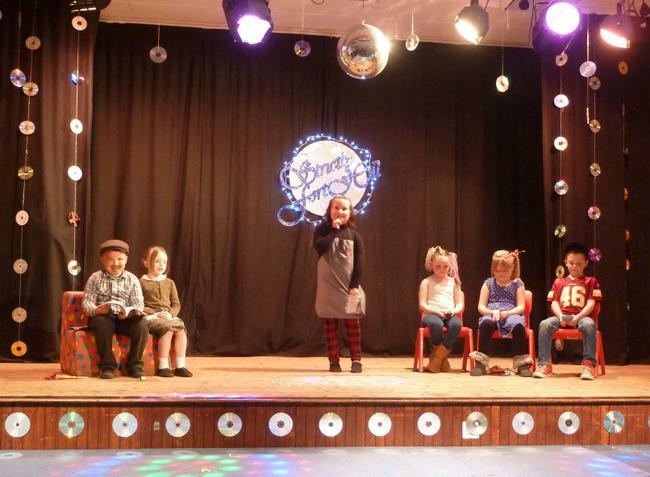 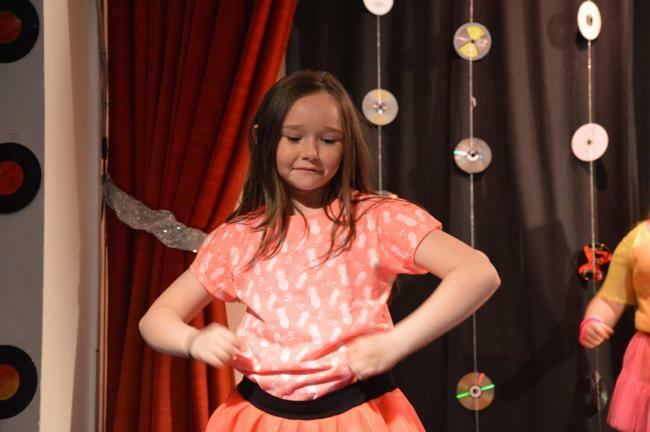 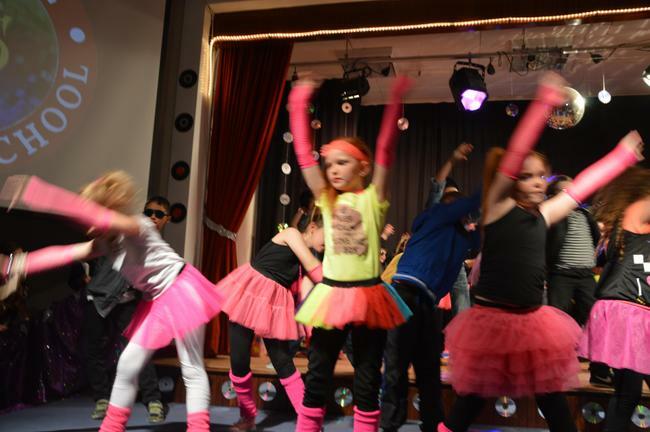 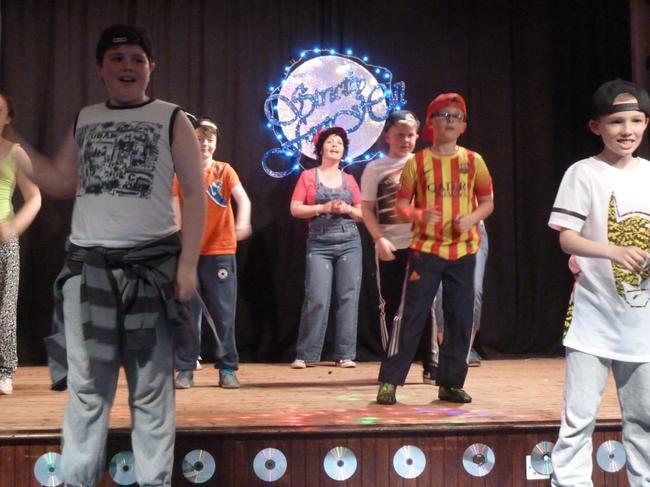 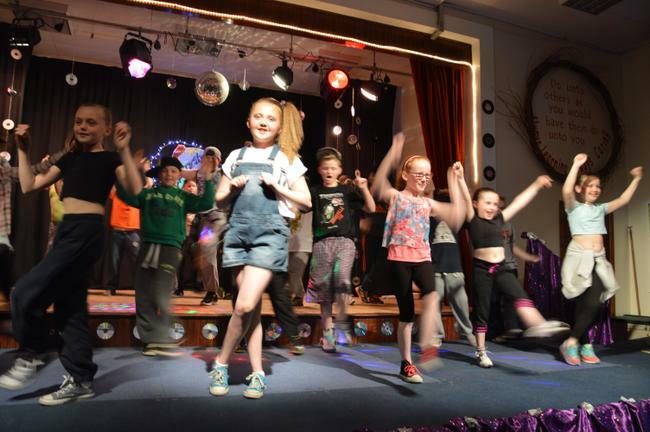 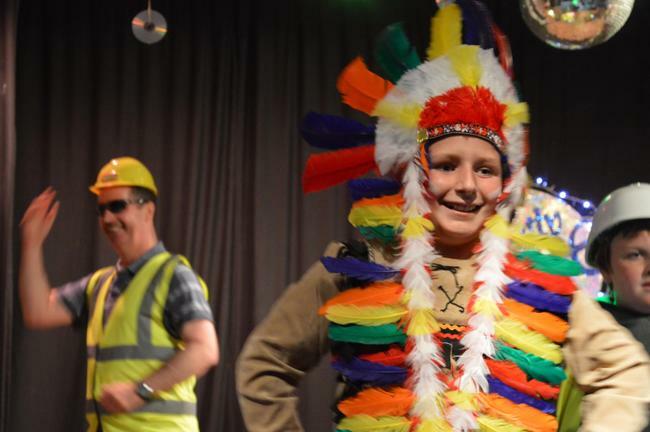 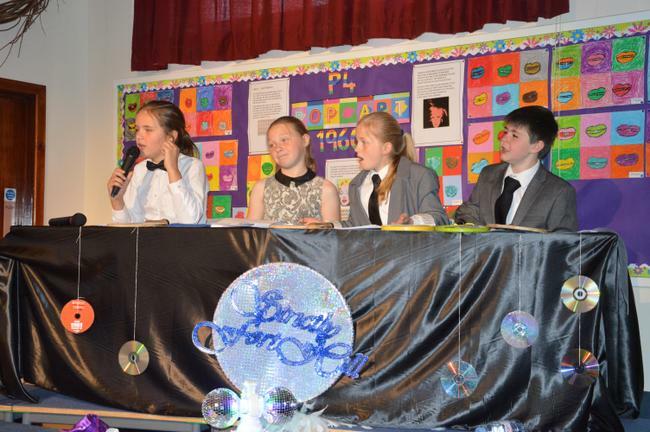 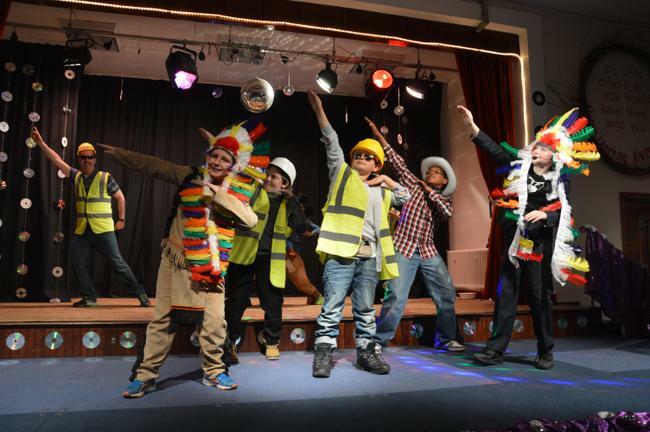 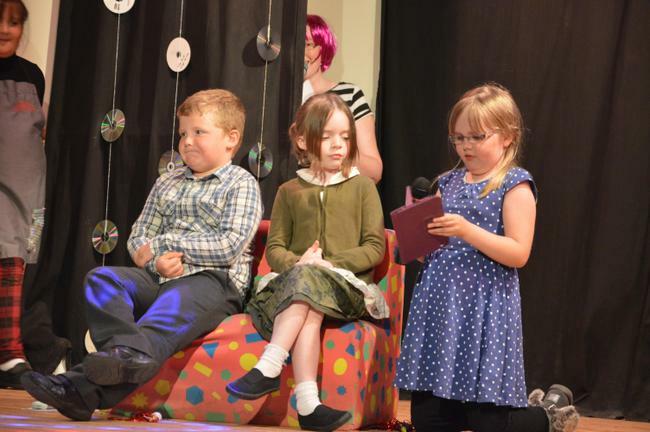 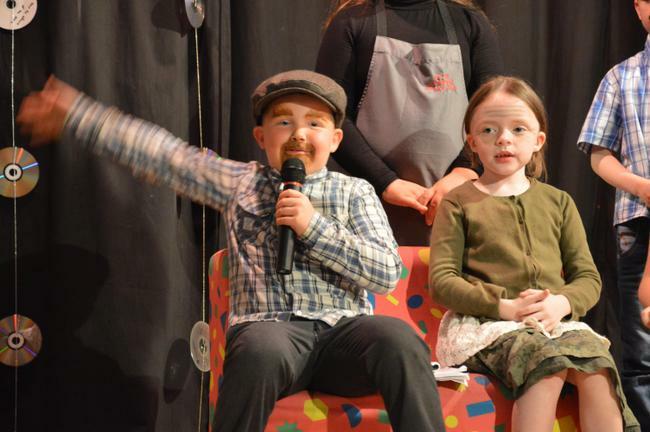 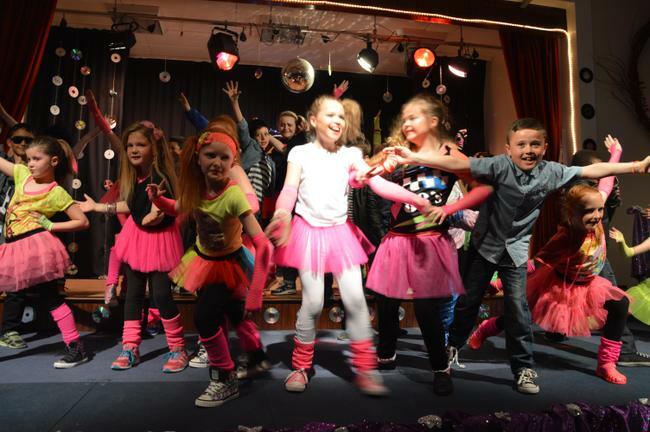 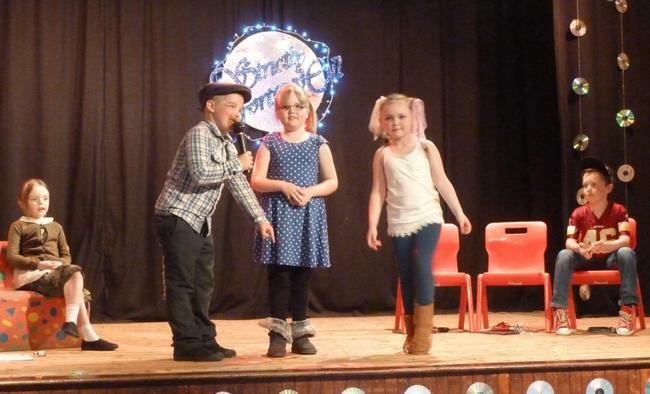 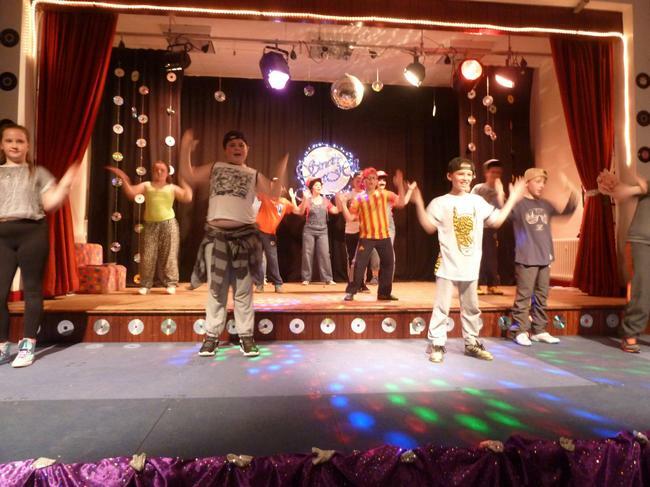 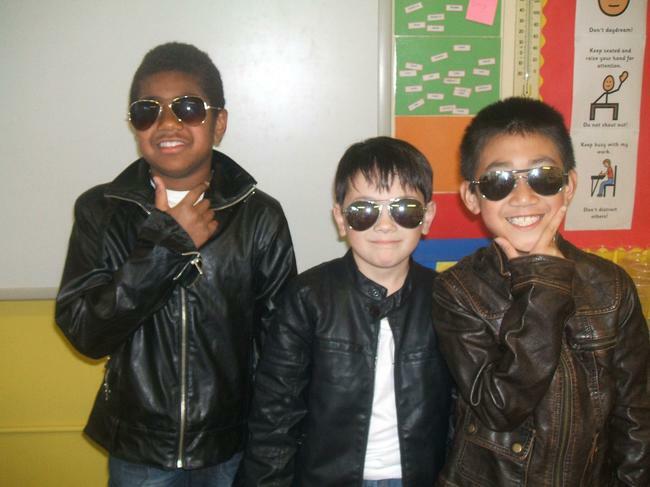 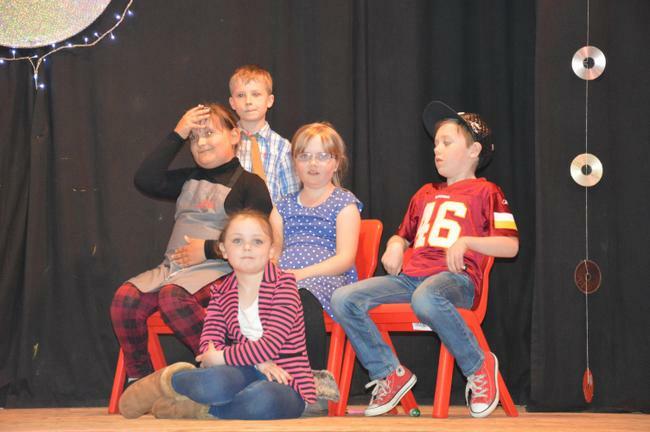 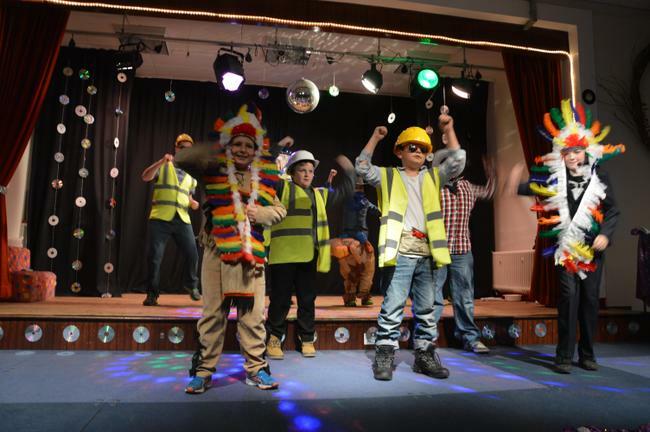 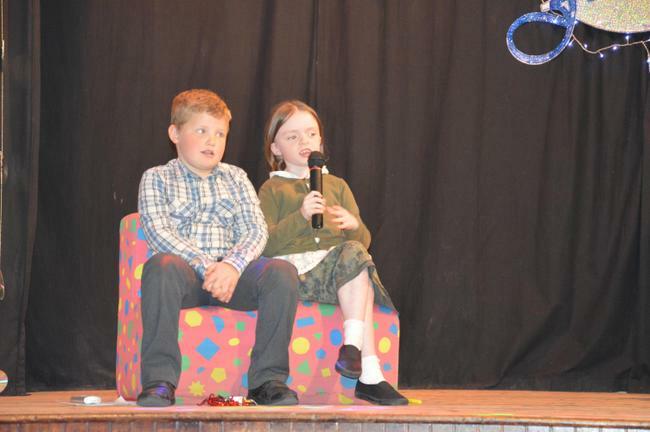 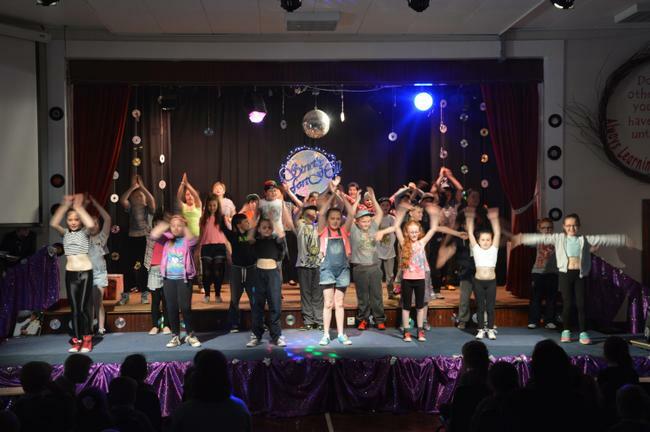 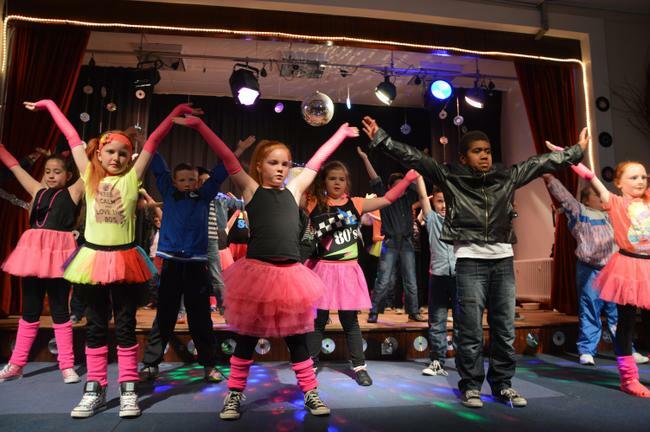 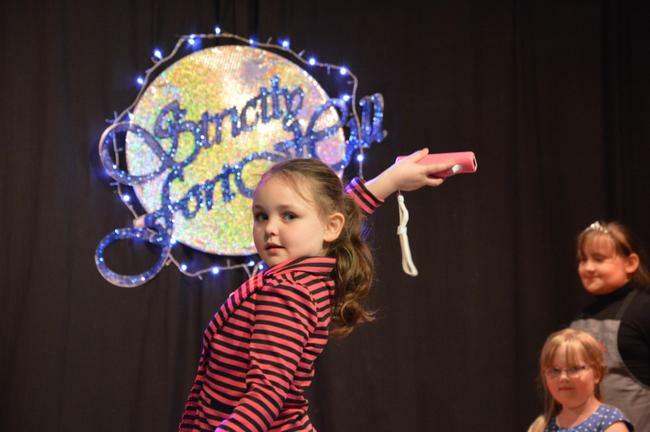 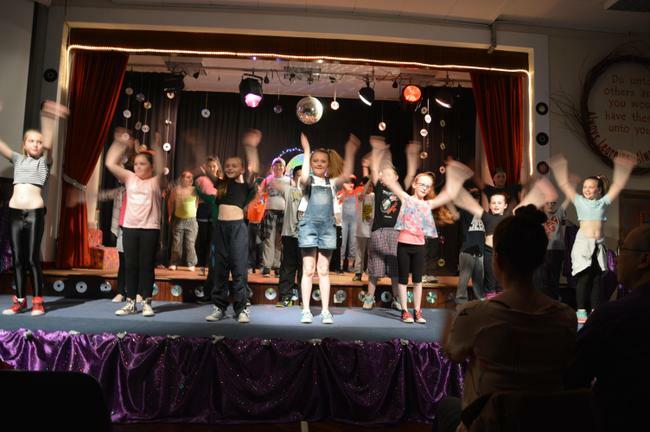 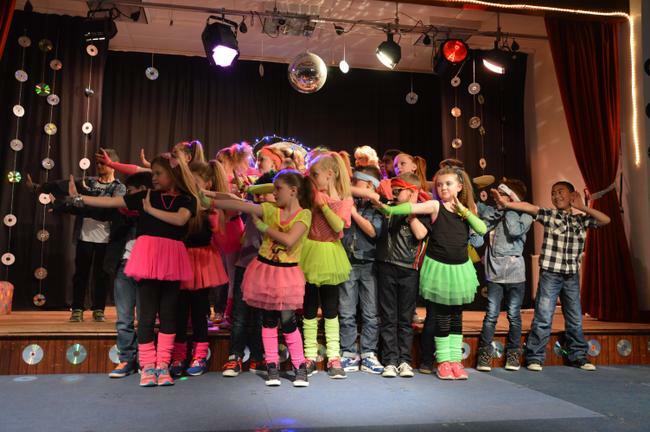 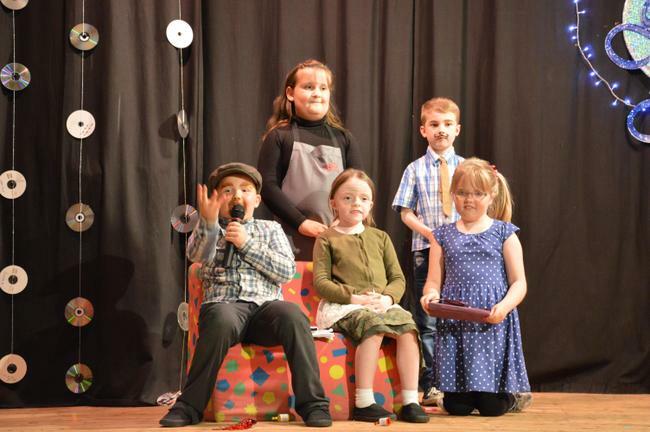 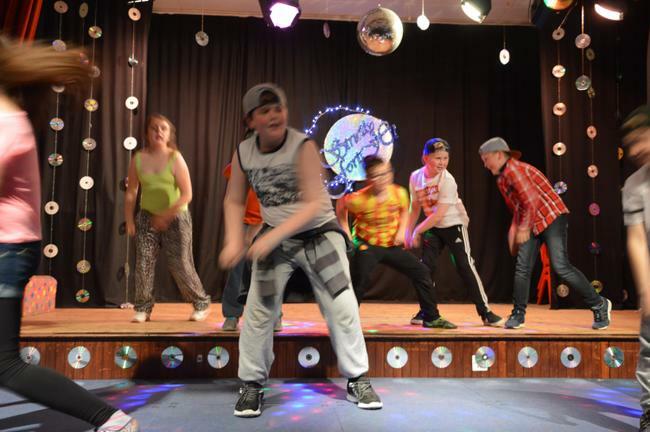 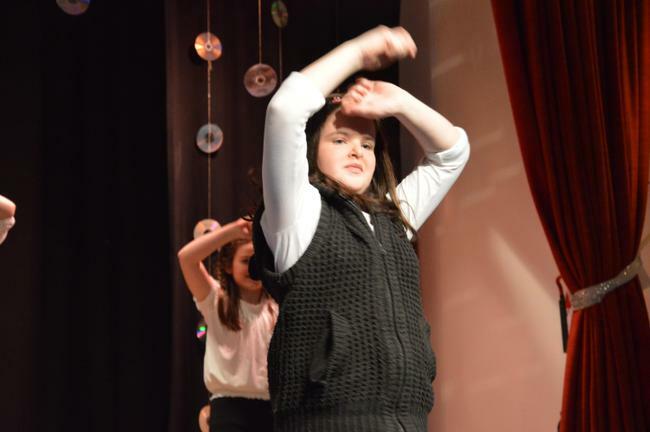 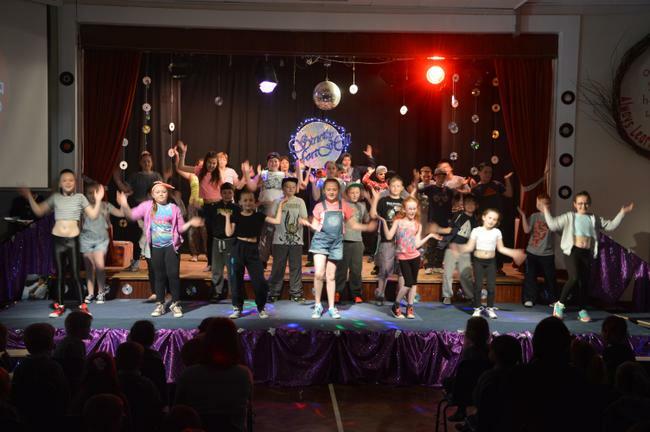 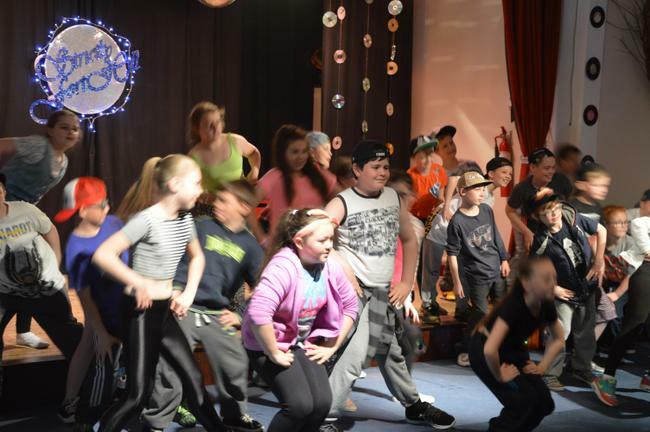 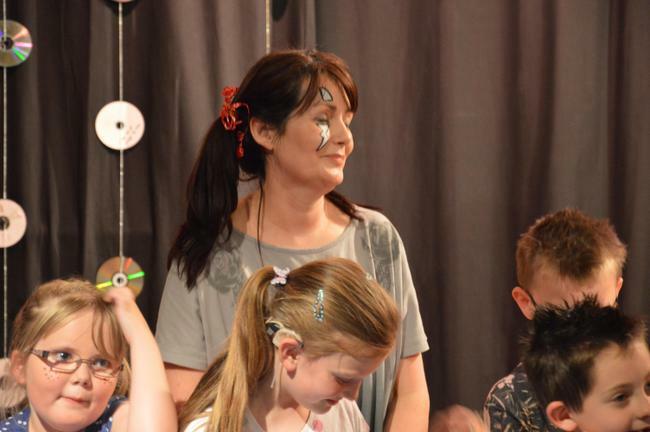 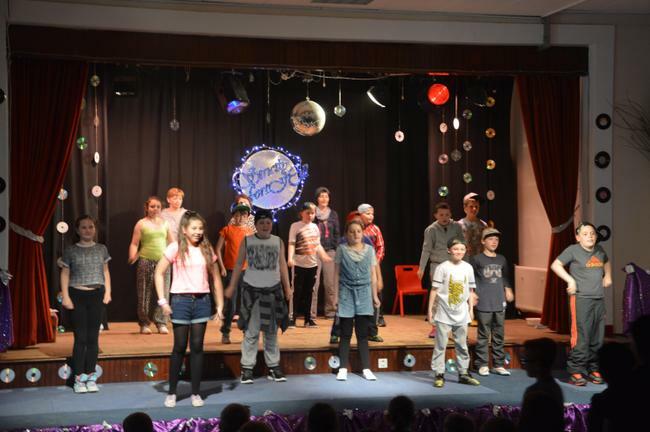 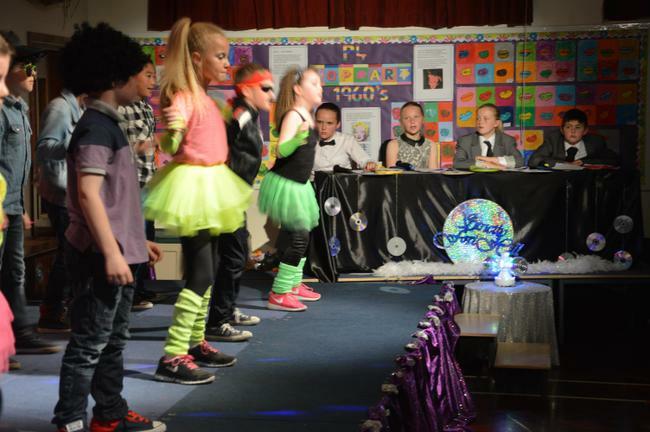 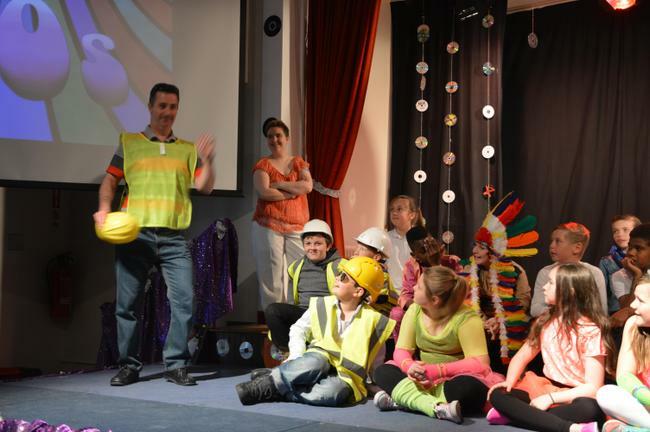 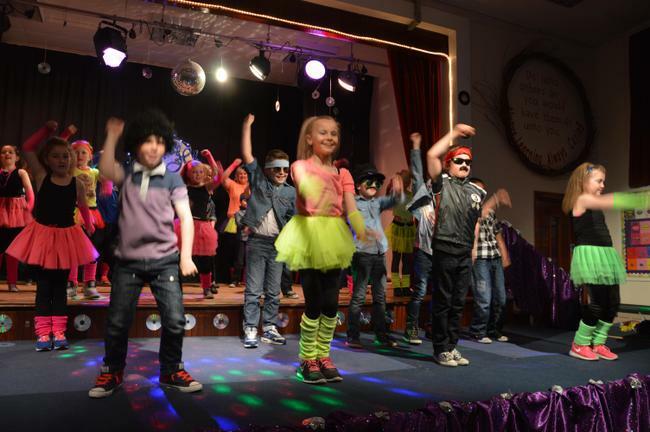 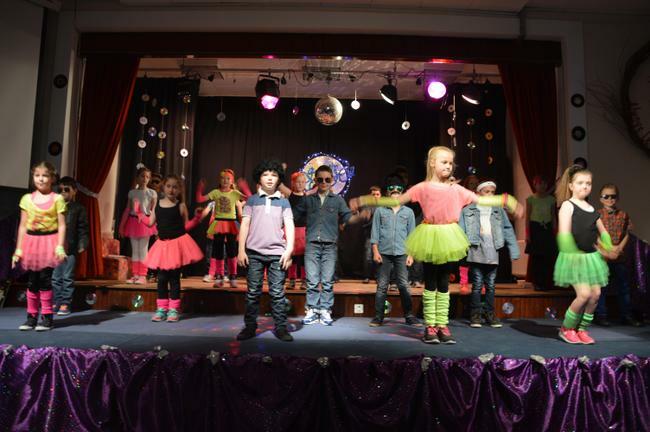 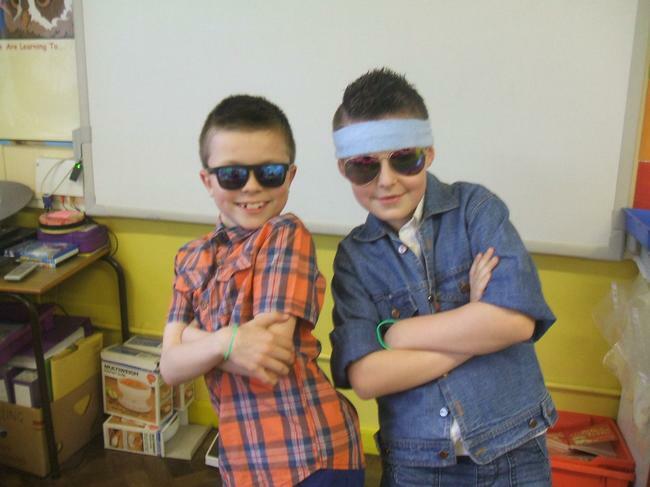 Primary 3 acted out a sketch all about gadgets, music and happenings in the 2000's. 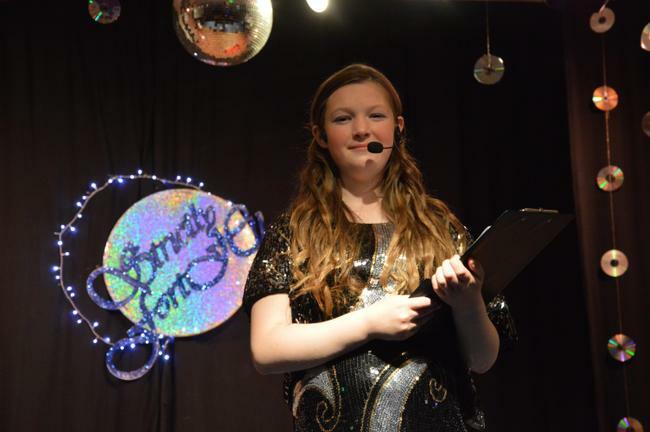 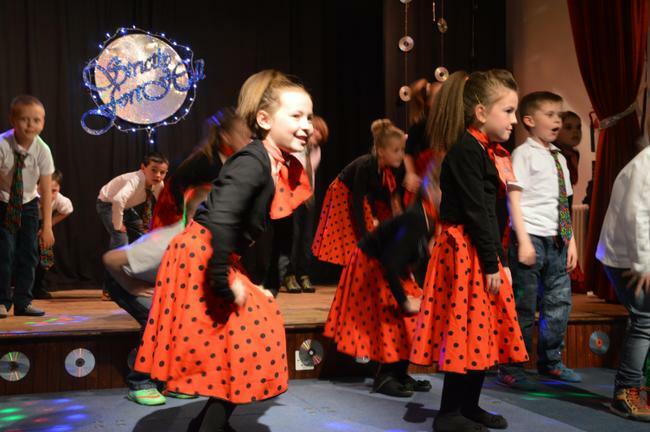 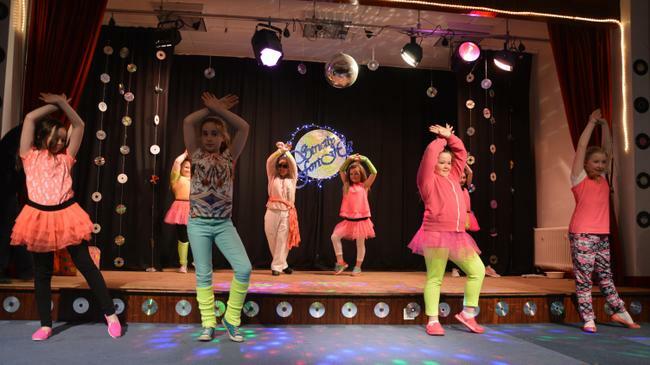 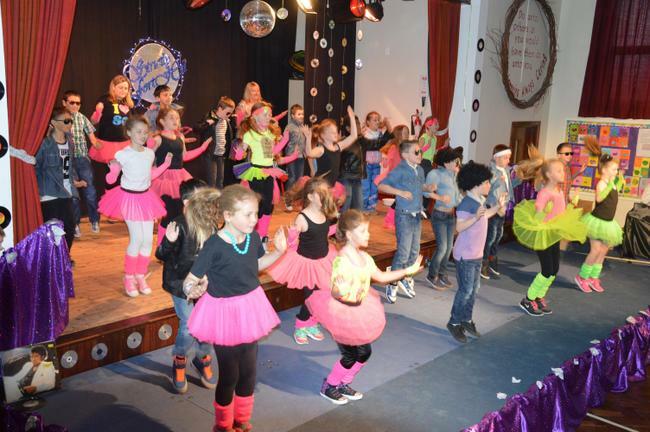 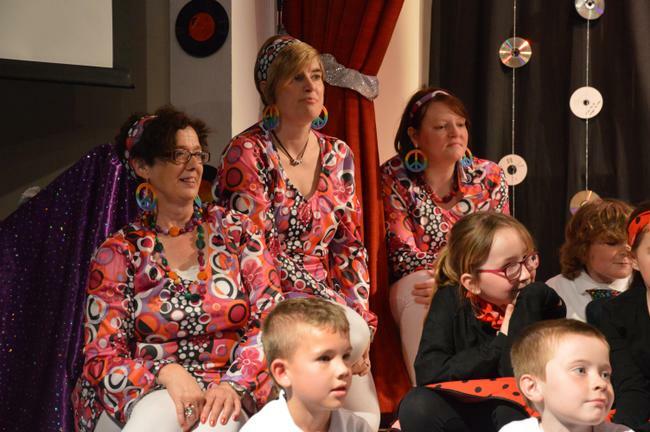 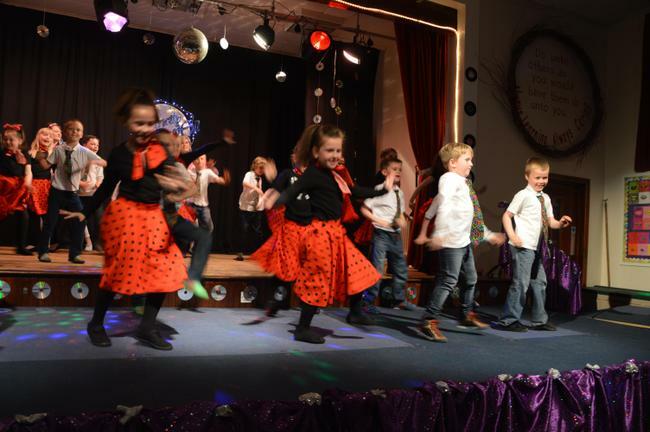 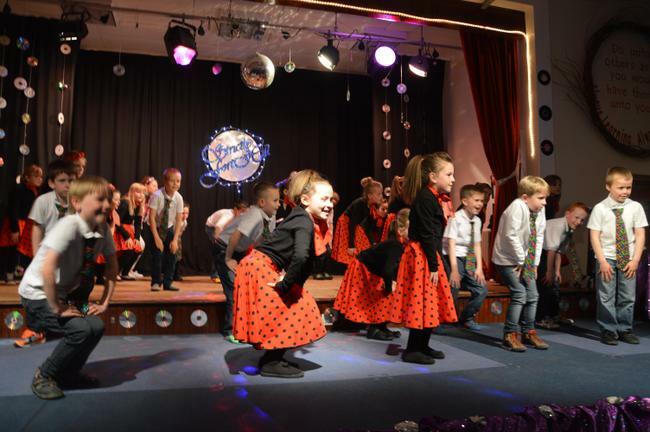 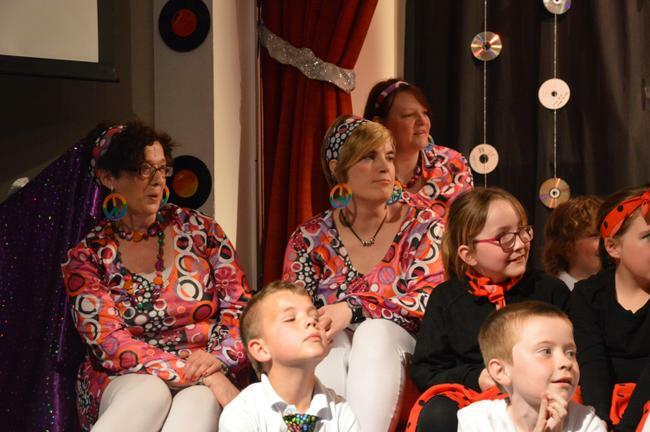 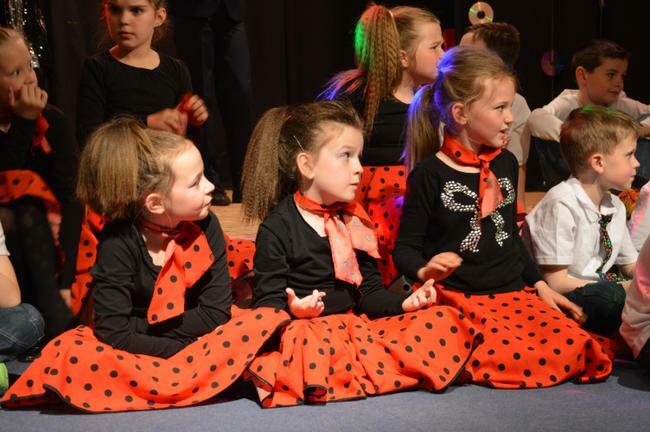 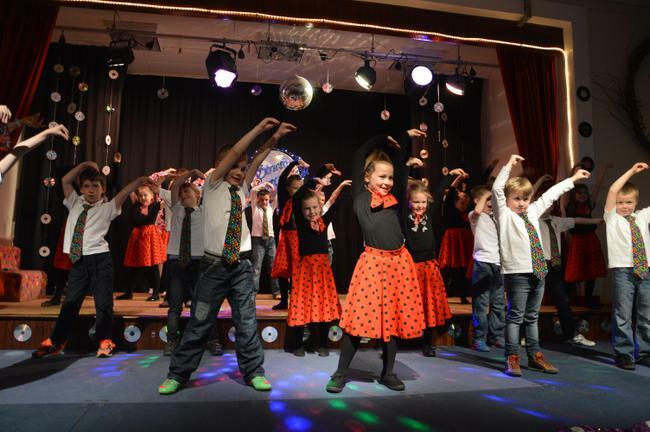 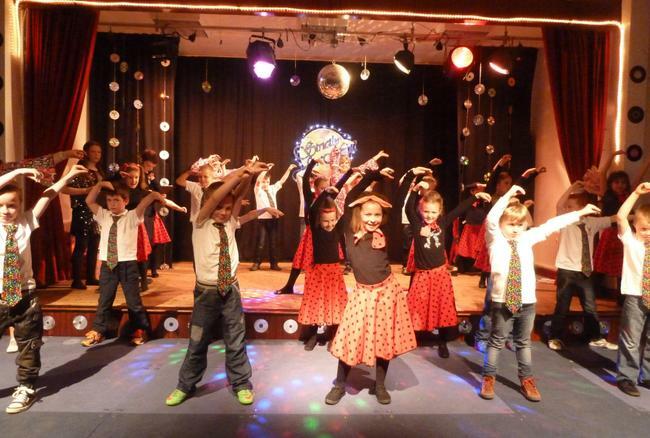 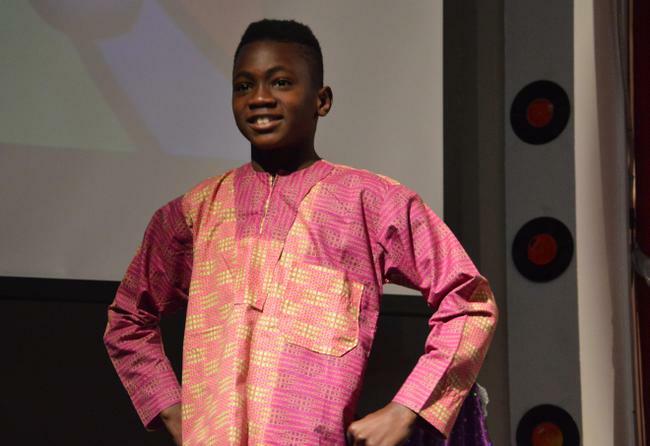 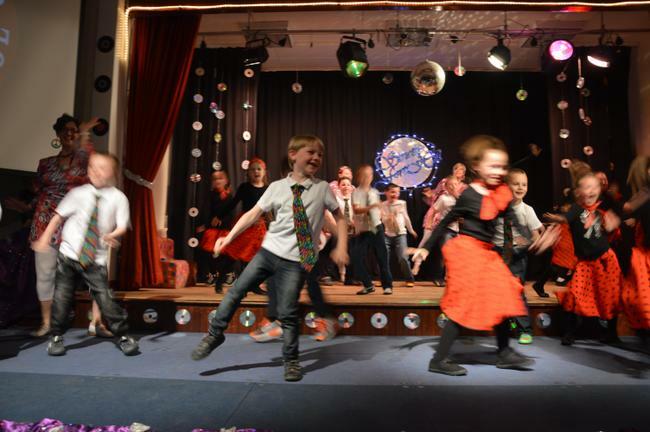 The teachers, assistants and children then danced to popular songs from that decade. 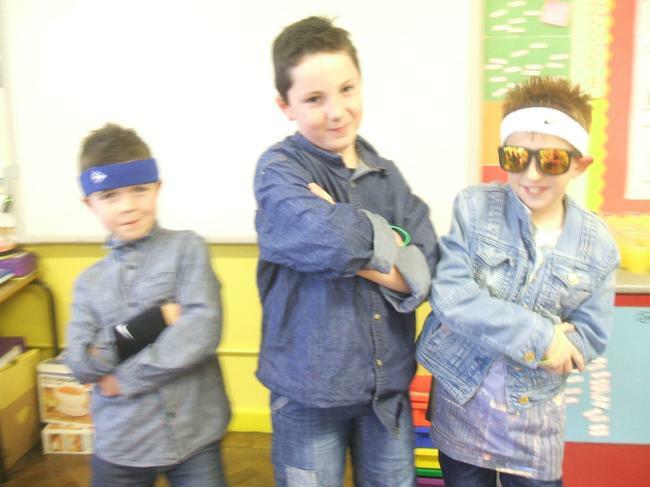 P4 learnt all about the 1960's. 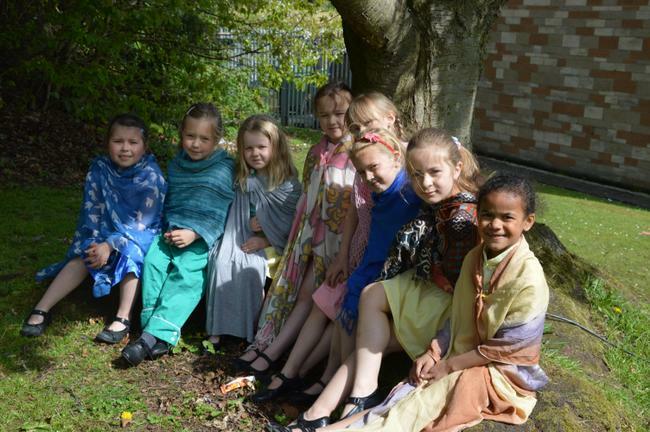 In class Miss Malcolm talked to the children about her memories of the 60's and in their ICT time the children researched and wrote reports about fashion, muisc, bands, famous people and much more. 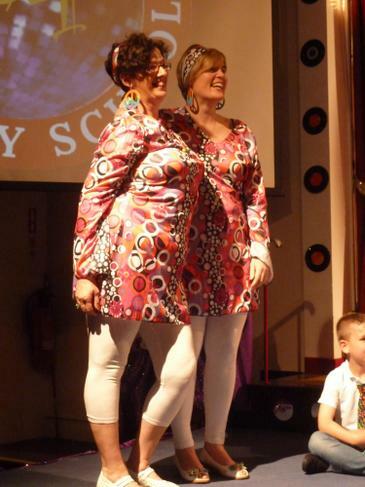 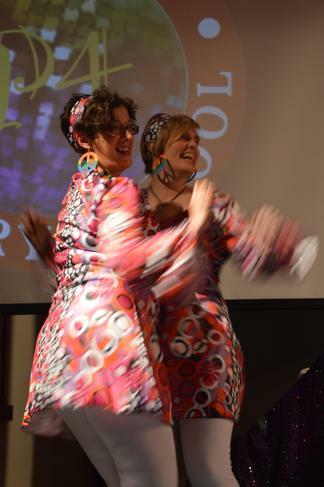 They loved dancing to the Chubby Checker Song - Lets Twist Again. 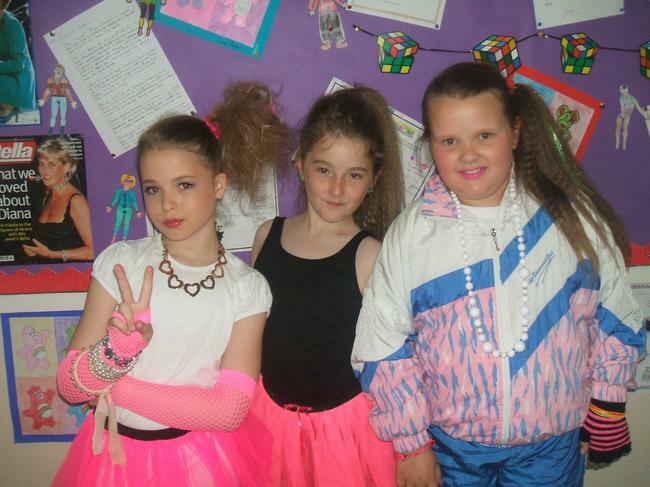 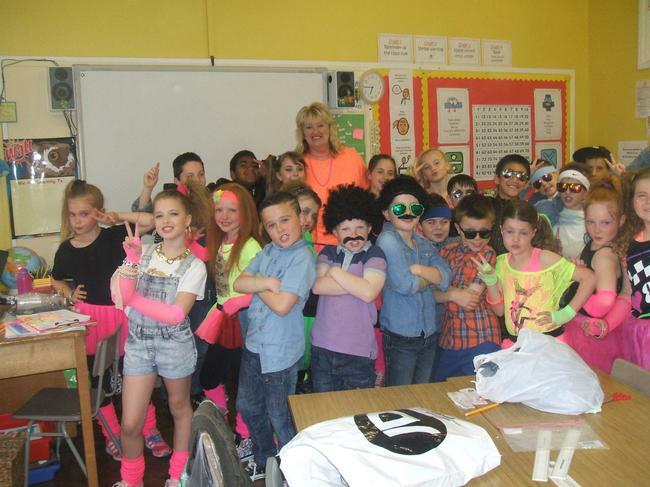 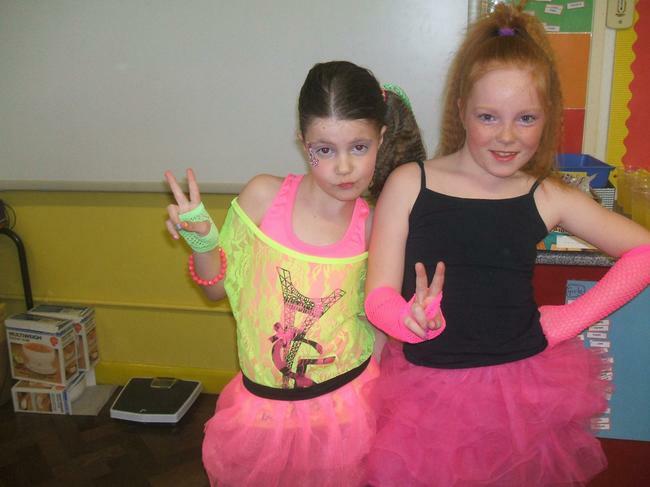 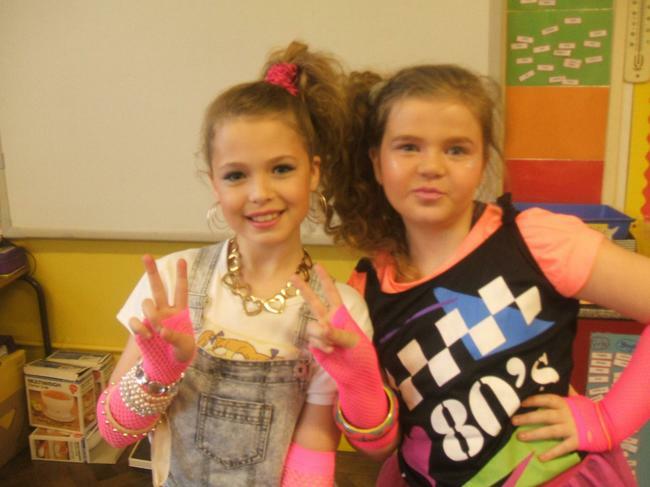 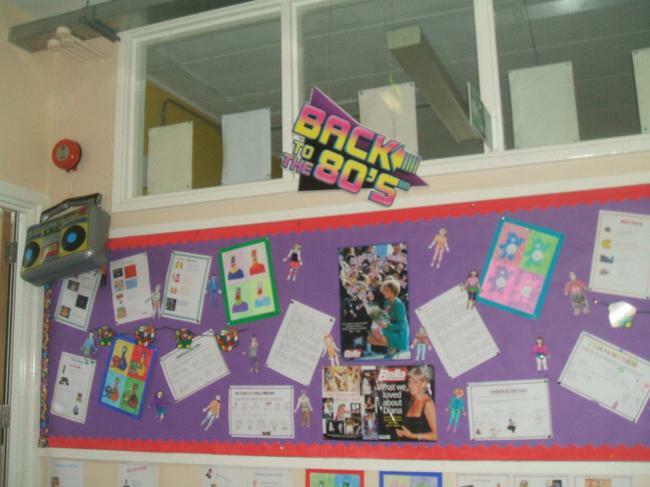 In class P5 learnt all about the 1980's. 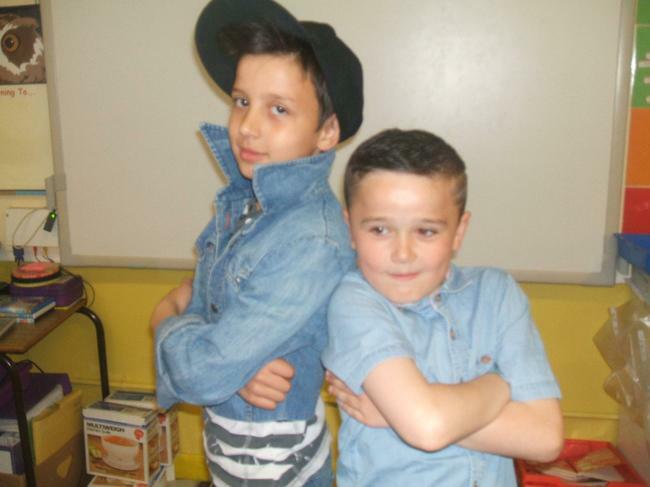 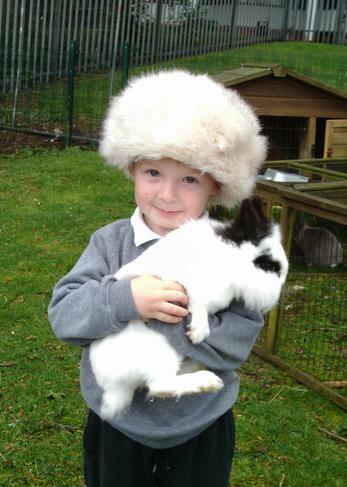 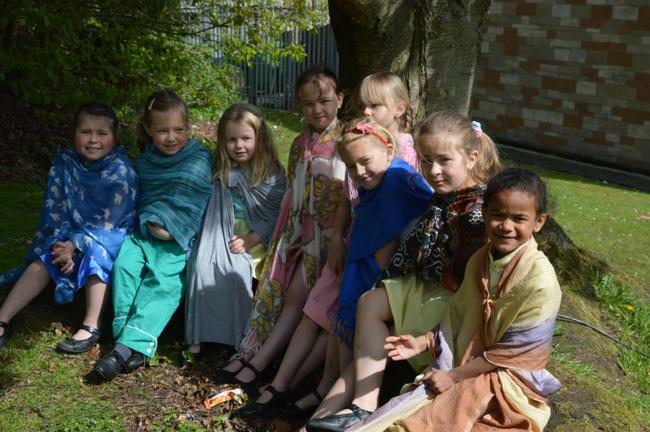 They loved learning about the crazy fashion, gadets, tv programmes and more. 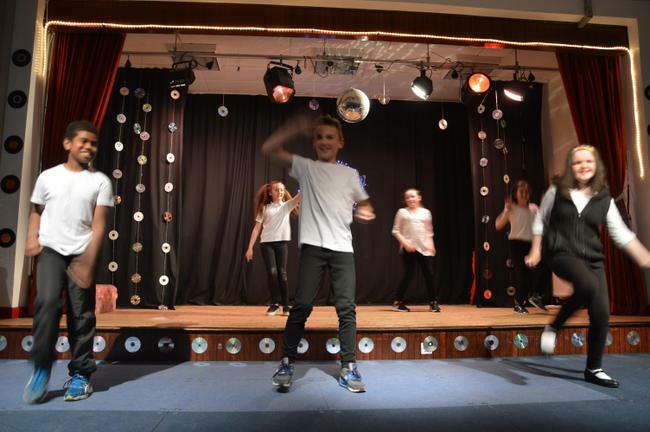 They danced to the Footloose. 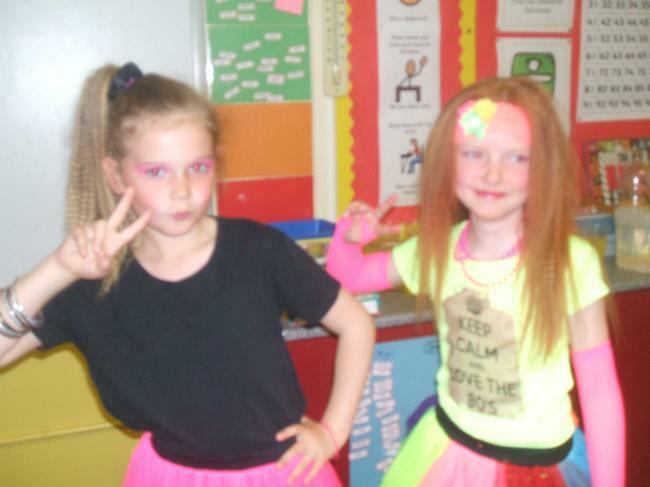 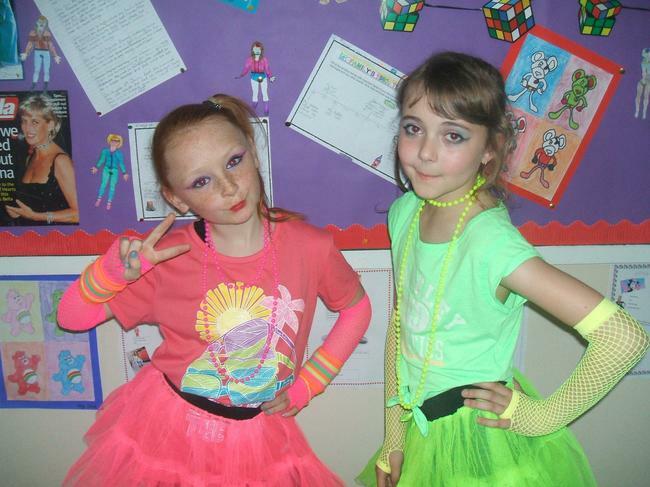 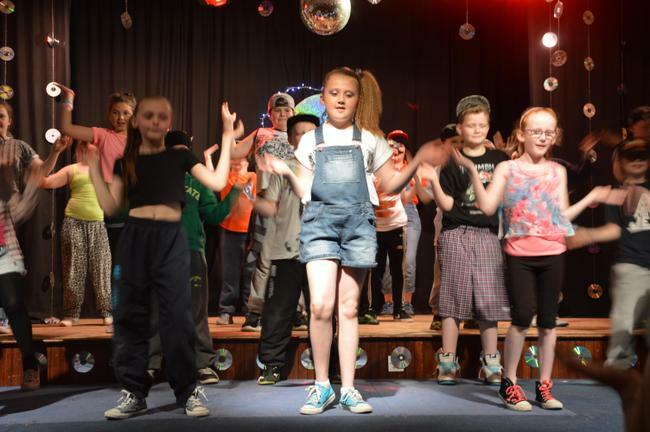 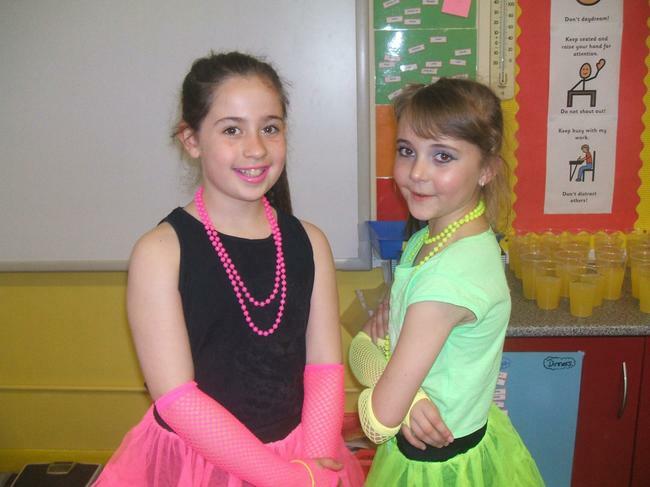 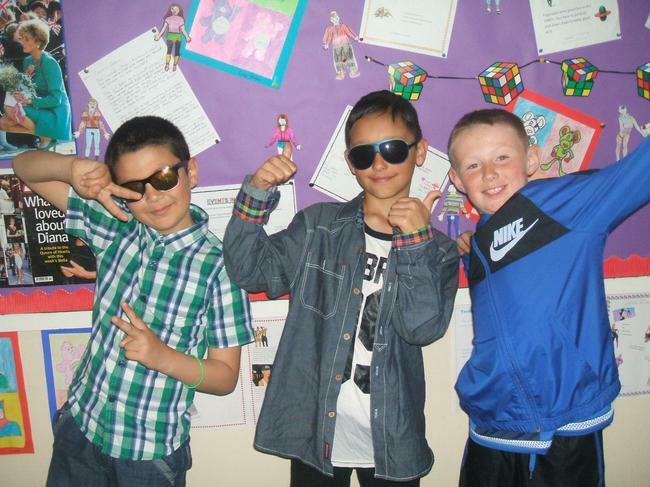 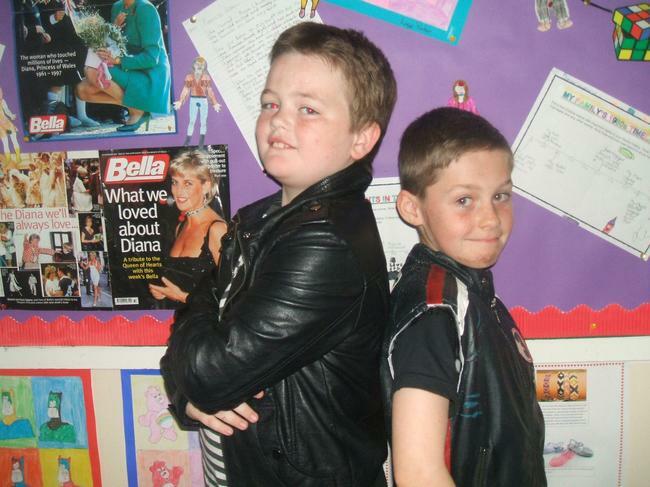 P6 learnt all about the 1990's. 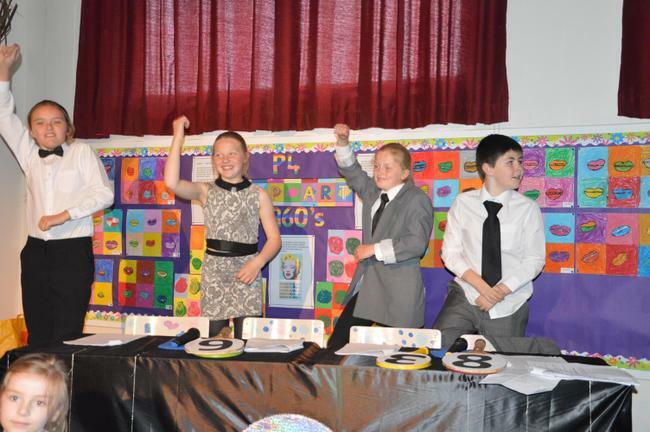 They used their computer time and class time to research fashion, technology, tv shows, cars and much more. 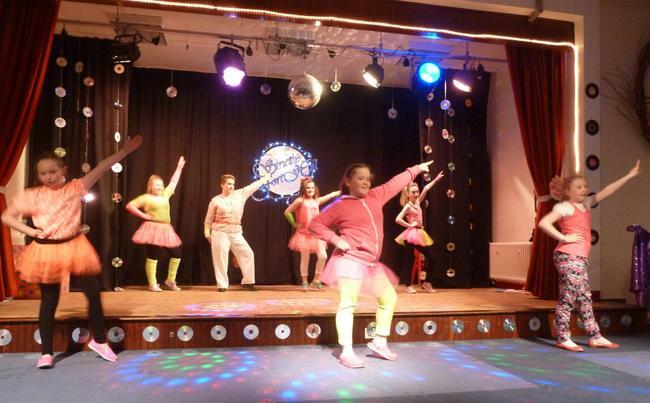 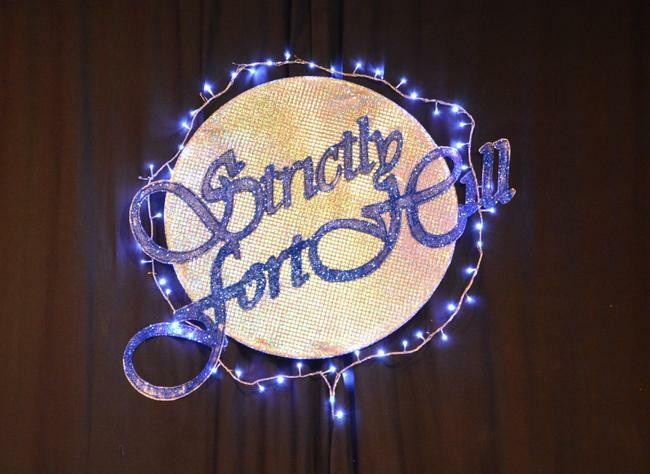 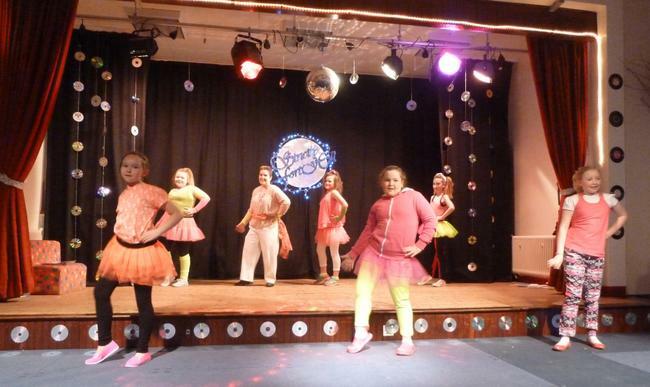 They performed to the S Club 7 song Bring it All Back. 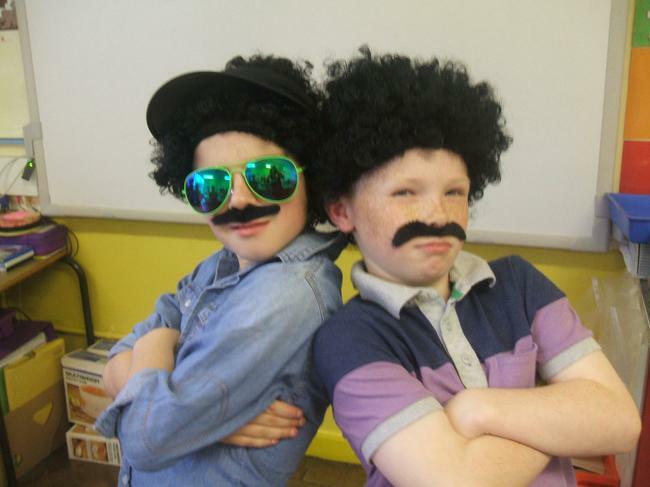 Primary 7 have been learning all about the 70's. 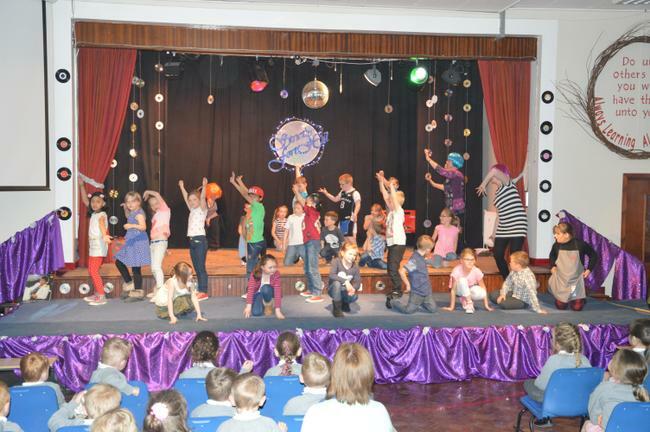 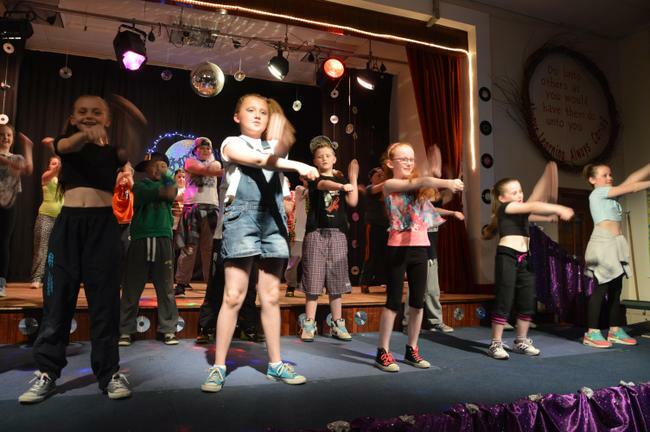 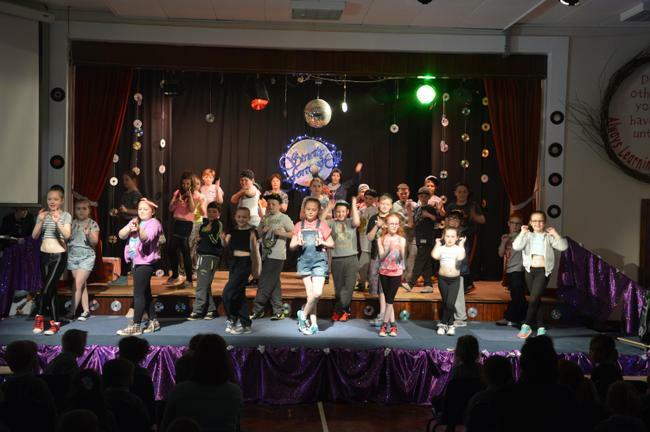 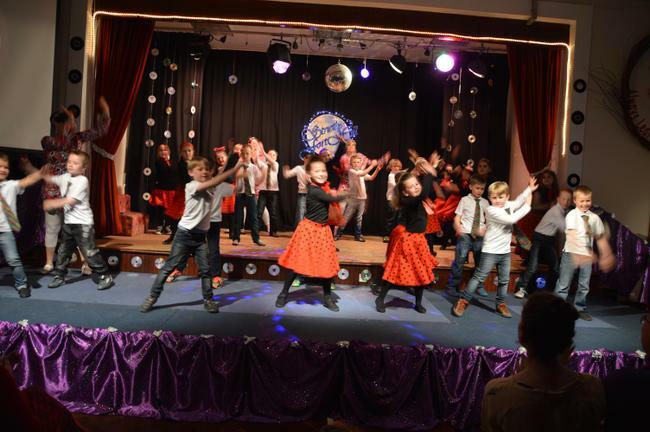 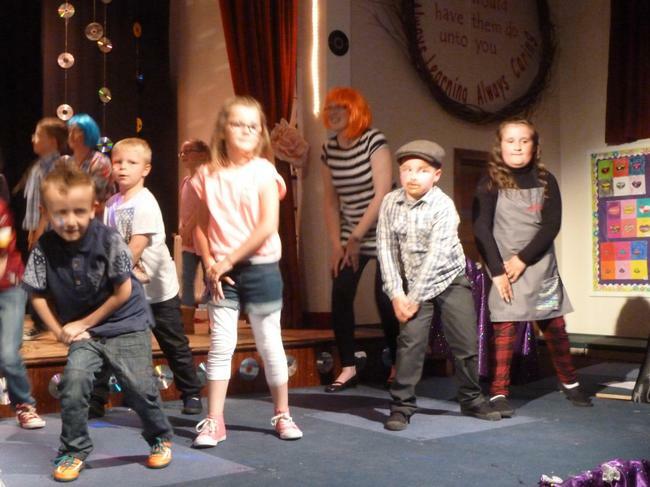 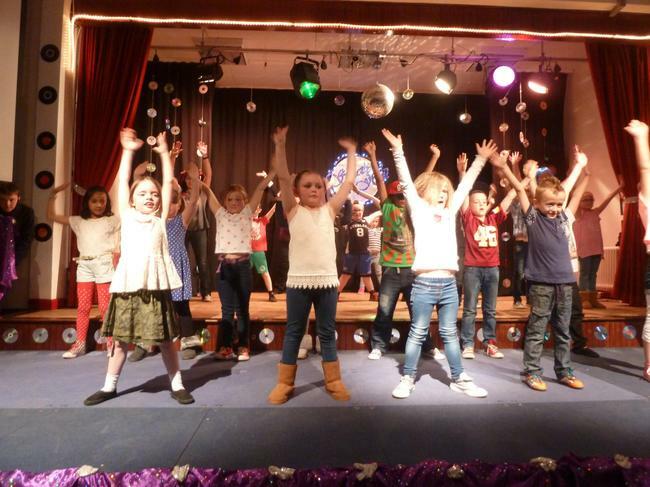 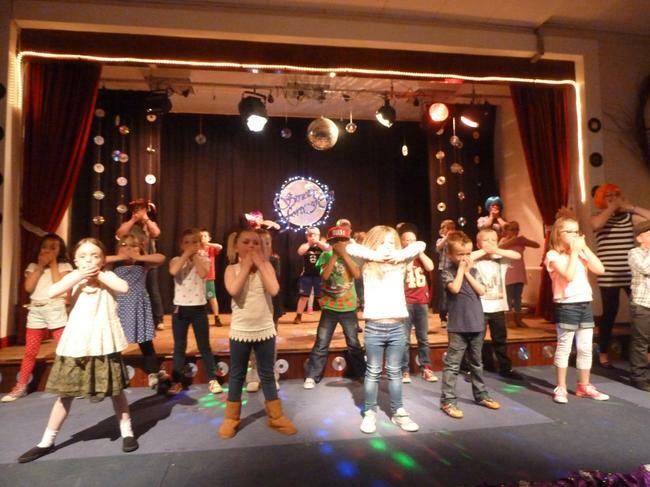 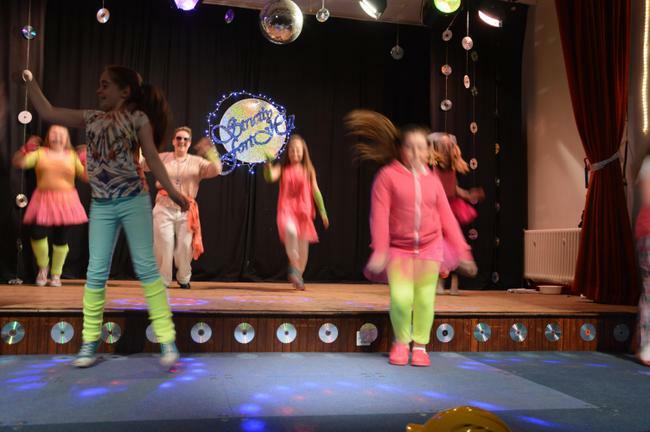 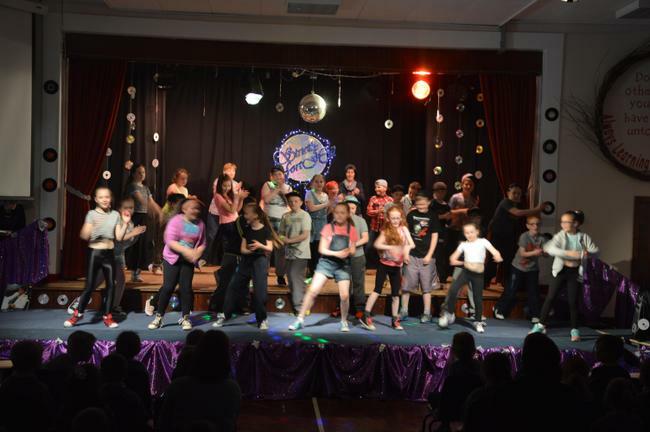 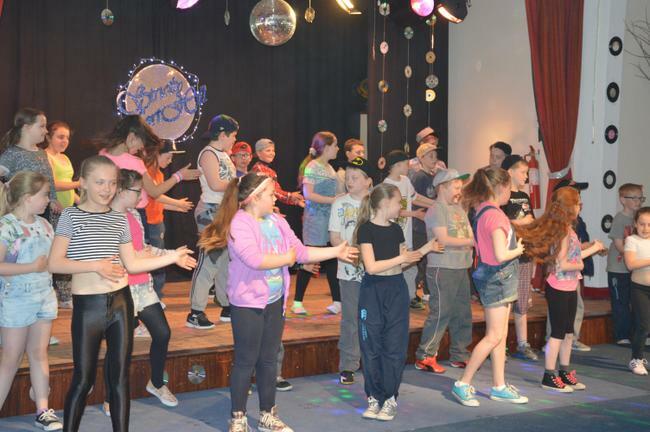 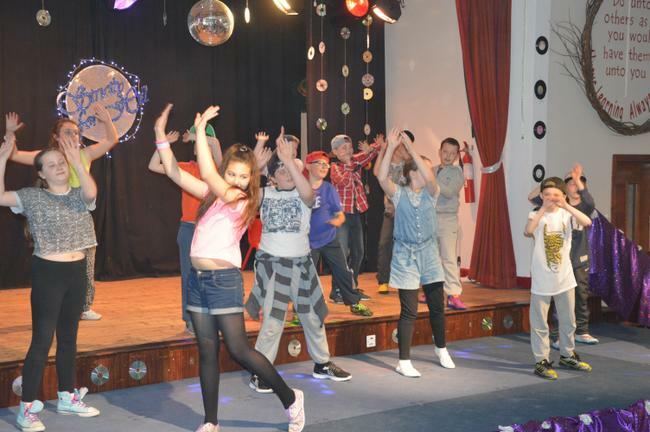 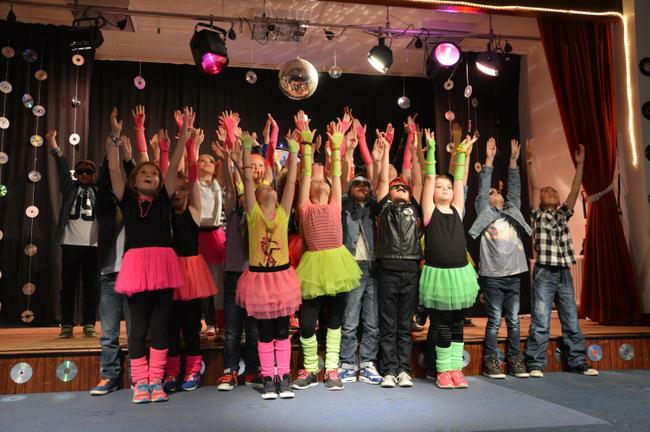 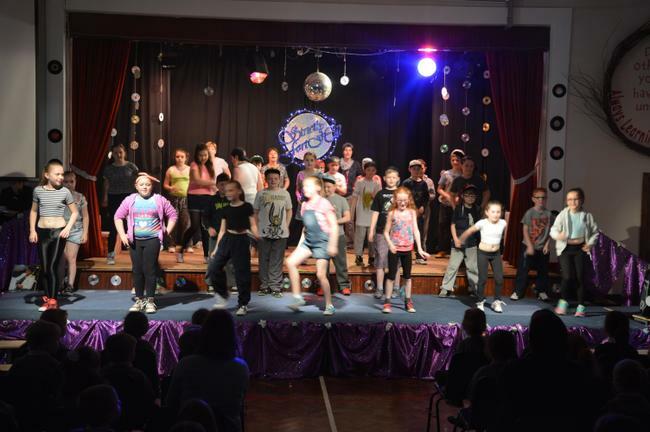 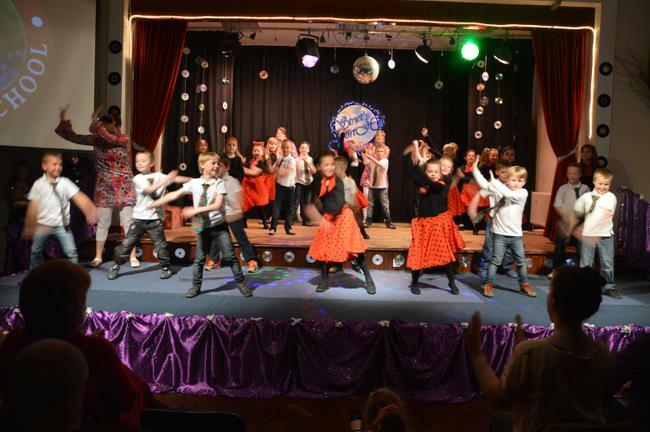 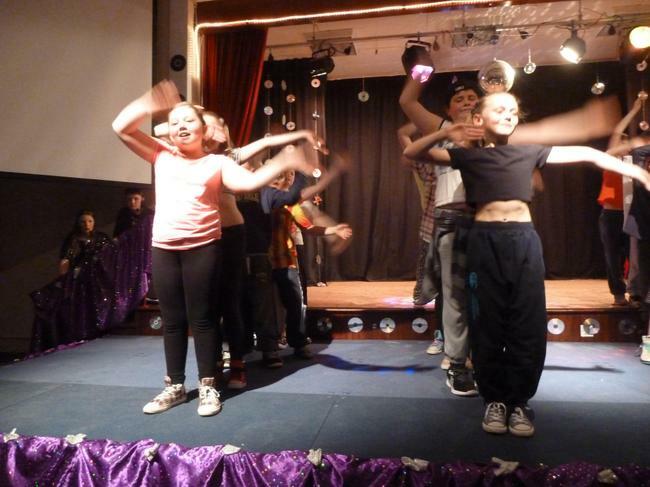 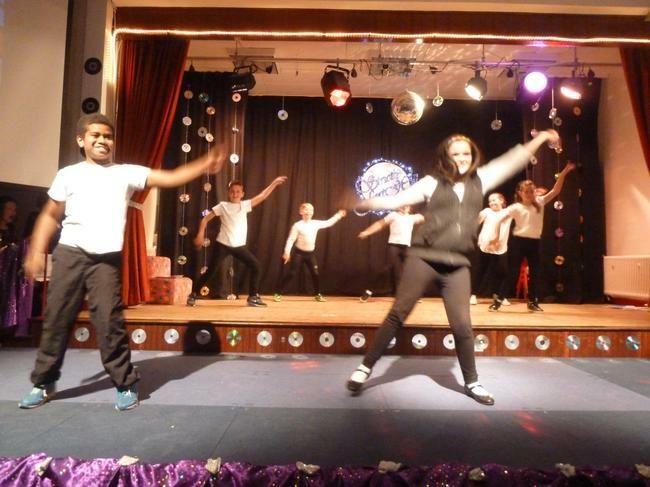 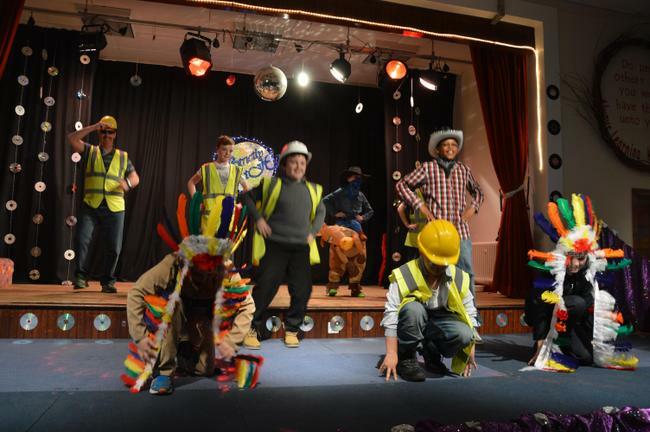 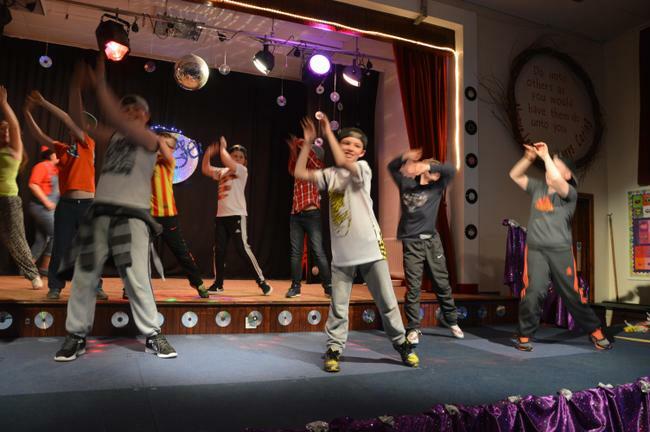 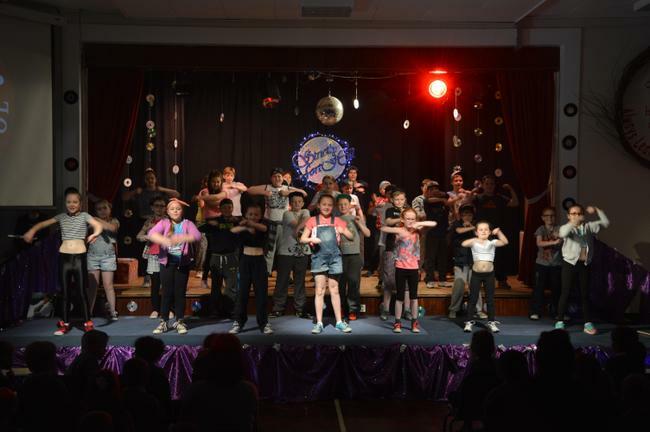 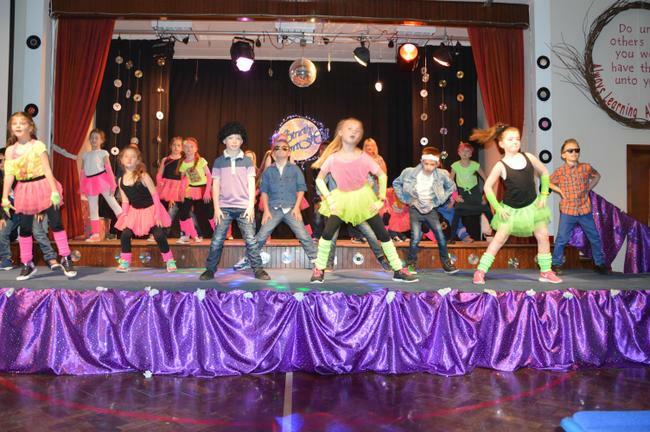 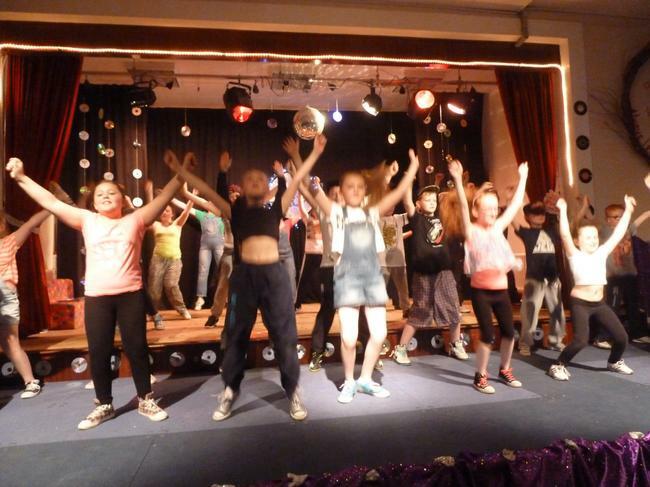 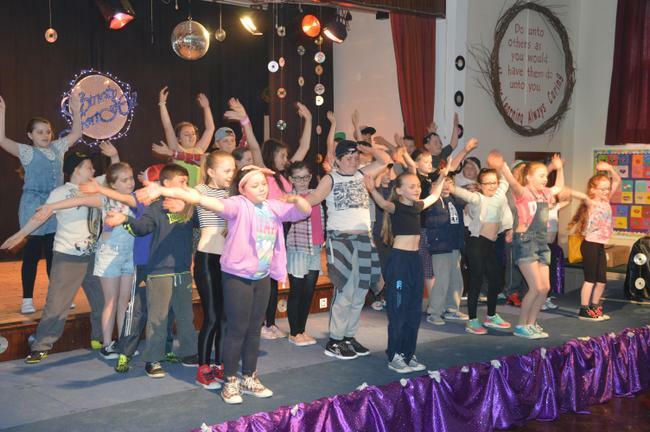 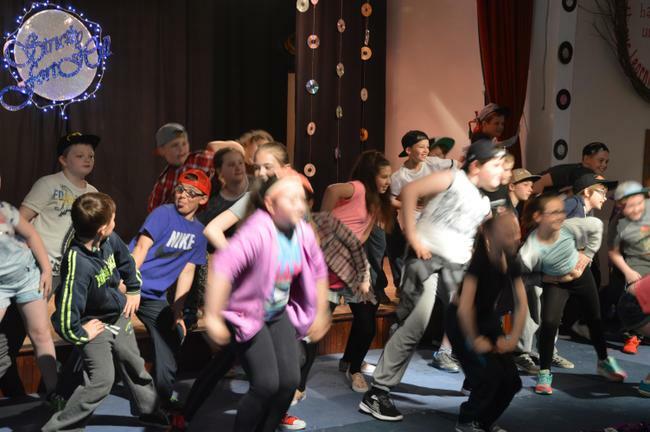 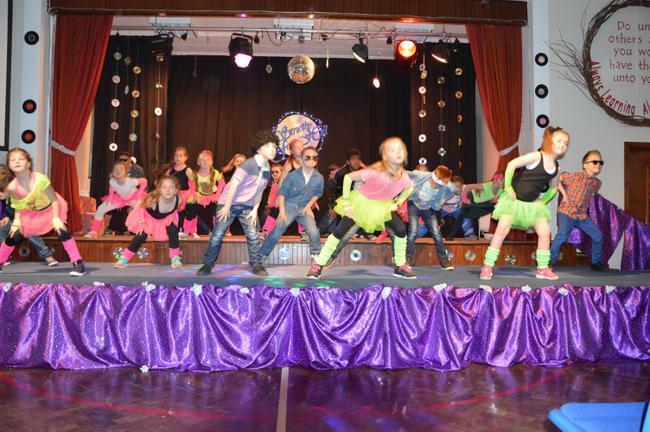 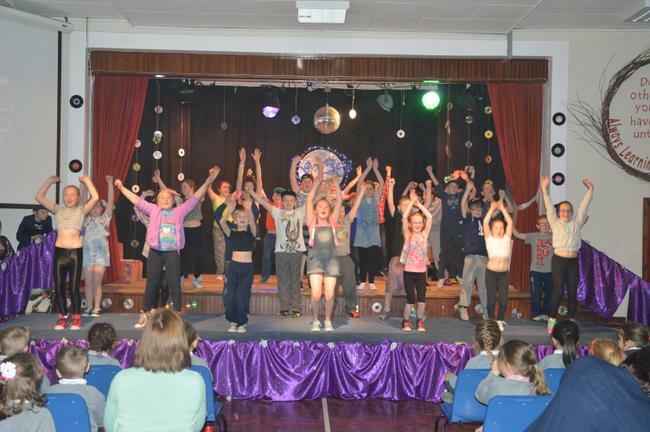 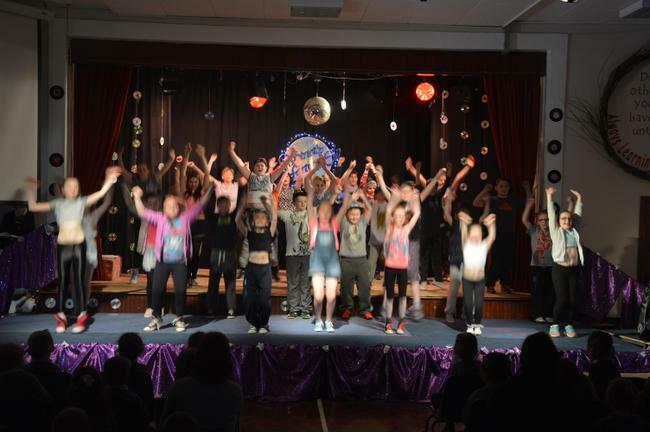 The class along with Mr Weatherall and Mrs Walsh dance to YMCA, Staying Alive and Night Fever.